Missouri is called the “Cave State” in recognition of the fact that we have, within our state borders, 6,400 caves. Some of them are very large, and some of them are very small. Some of them are tourist attractions, and some of them are too small and narrow for even the most dedicated spelunker to find his way into. But all of them are a feature of Missouri’s karst geology. Caves develop when underground water dissolves the underlying rock. In the case of our area, it is limestone and dolomite rock that is dissolved. And if that underground cave gets close enough to the surface…well, the surface is going to “cave in”, forming a hole in the ground. That hole is called a sinkhole. The picture above is of Slaughter Sink, just outside our town. 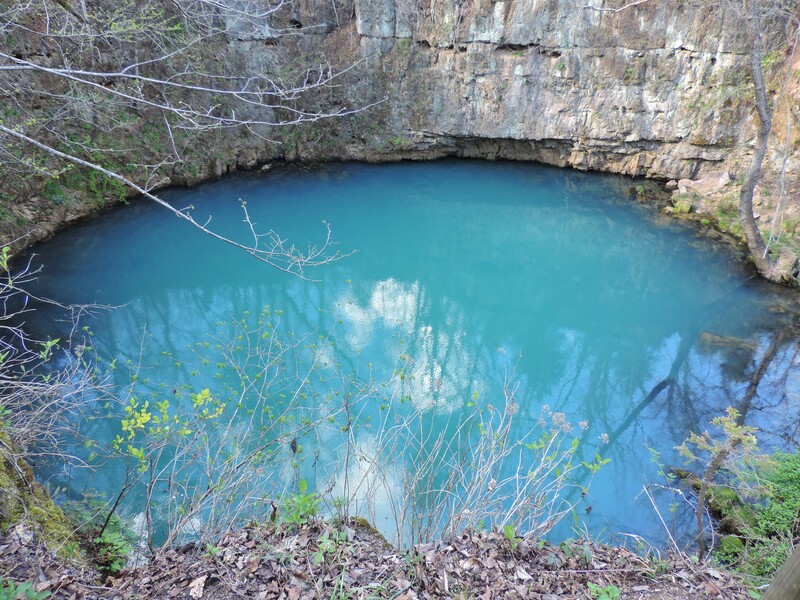 At a quarter of a mile wide, and 160 feet deep, it is one of the largest sinkholes in Missouri. One of its features is a promontory on which you can stand and look…seriously, don’t look down…look across, or around, but don’t look down! I have been to Slaughter Sink one time, and I stood on that promontory…and, seriously, I did not look down! DANGER! But I do have to admit I enjoyed that one visit, and was very proud of myself for being able to walk out onto that rock. My husband and I have been visiting our state parks here in Missouri, and state parks across the country for many years. They provide invigorating hikes, exciting wildlife viewing, and interesting and enlightening nature programs. We have also discovered that they are fun to visit as we travel to enjoy the Christmas season. To escape the pressures of daily life, to get away from the news, and to get a head start on our Christmas shopping, we recently traveled to Galena, Illinois. Galena is a small town in northwestern Illinois (you will find yourself only about 15 miles from the Wisconsin border). The historic Main Street in Galena, with so, so many wonderful stores, full of so, so many wonderful items. We stayed in the Hellman House Bed and Breakfast, built in 1895, atop of a hill providing us a beautiful view of the city. For dining, there are so many options, and the Green Tavern on Main Street was one of our choices. While enjoying our weekend in Galena, and in an attempt to get me out of the stores, Jim discovered that Galena is also home to the Ulysses S. Grant Home State Historic Site. 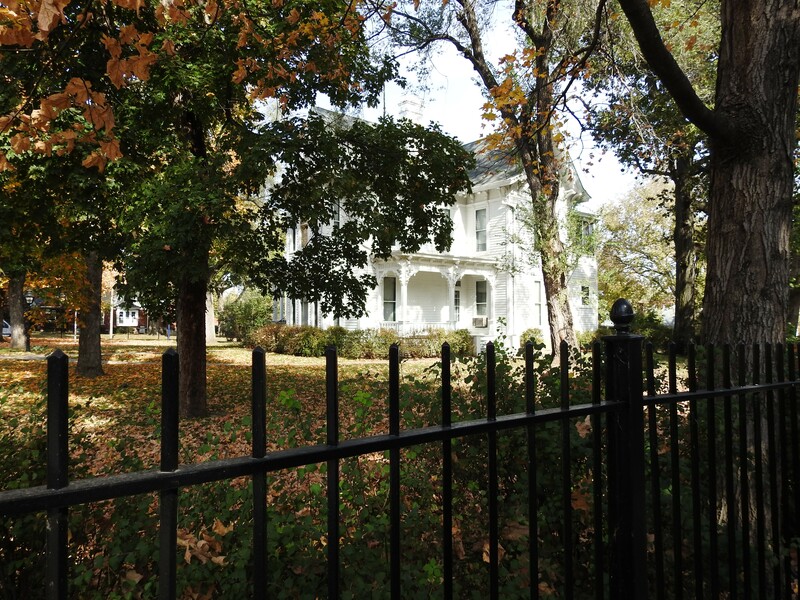 The home was built in 1860, and presented to the Grant family in 1865 in gratitude for his service in the Civil War. The family lived in the home until Grant was elected President in 1868. After his election, he visited the home infrequently, but maintained it as his voting residency. 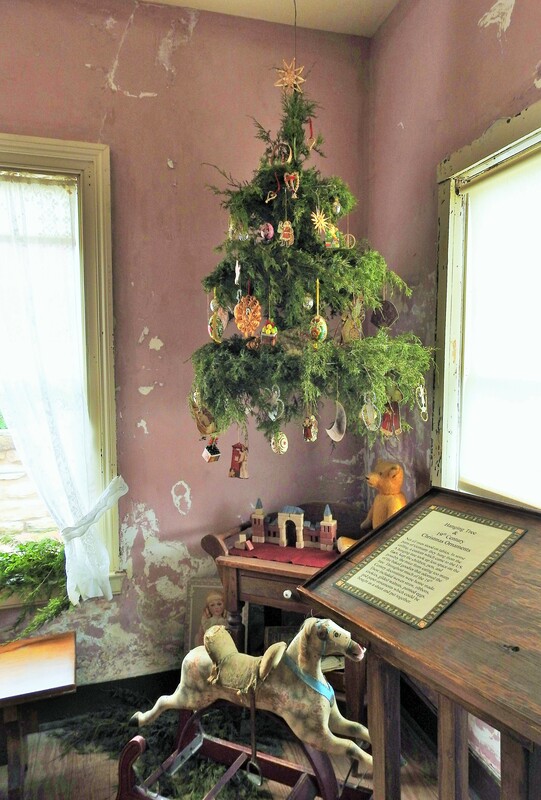 On the particular weekend of our visit, it was open for tours…and it was decorated for the Christmas season in the manner in which the Grants would have decorated while they lived in Galena. A view of Galena from the front lawn of the Grant home. and the rest of the parlor. This was Grant’s favorite room in the house, his study/library. Even the kitchen is decorated for Christmas. This weekend, we again ventured out. This time we were on our way to Hermann, Missouri to visit the Deutschheim State Historic Site. Hermann is the center of Missouri’s wine country, and so we planned on visiting a couple of wineries, too. Deutschheim State Historic Site was established to preserve the heritage of the German immigrants who moved to east-central Missouri between 1820 and 1860. They became the residents of a new town, Hermann, founded by the German Settlement Society of Philadelphia on 1,000 acres of farmland along the Missouri River. The crop these Germans introduced to the area was grapes, and the product they made was wine. When you visit Deutchheim, you will see some vines that are over one hundred years old, vines that helped establish the wine producing industry which is still expanding across the state. Wine is serious business in Missouri, and I can personally tell you that it is well worth your effort to experience some of our state’s great wines. This particular weekend, Deutshheim was celebrating a Weihnachtsfest, or Christmas celebration. We toured one of the homes, decorated for Christmas, and enjoyed traditional cookies that would have been made for the Christmas celebrations of the German immigrants, including lebkuchen, chocolate lebkuchen, springerle, and pfeffernusse. They also had a display of springerle molds and rolling pins, and many of these were for sale in the gift shop. I am German from both sides of my family, and these Christmas traditions so reminded me of watching my grandmothers make springerle and lebkuchen. If I was not in the spirit before visiting Deutschheim, I certainly am in the Christmas spirit now. It felt like Christmas as soon as we arrived at the door. One of my favorite scenes in the house was this Christmas tree, hung from the ceiling with wire. This method of putting up the tree not only saved space, it also kept little hands out of mischief. I also enjoyed the “real” Noble fir tree set up in the parlor. It is the type fir that was the inspiration for the “feather” trees so indicative of German Christmas tradition. It was decorated with traditional scherenschnitte ornaments (I am so German, I spelled that correctly on the first try!). the Noble fir…look particularly at the top of the tree to see how it inspired the feather tree. This display of feather trees is decorated with ornaments indicative of different eras in Hermann’s Christmas traditions. The first tree on the left has scherenschnitte ornaments that were cut in the 1940’s. with the molds and rolling pins on display. We enjoyed lunch at the Vintage restaurant at Stonehill Winery. The restaurant serves authentic German food in portion sizes I remember my Dad enjoying! Our favorite winery is just outside Hermann, Adam Puchta. We needed to stop here because a certain son-in-law who will be visiting from Minnesota loves their red table wine, Hunter’s Red…and so do we! You can find out more about each of these sites we visited by visiting their websites. Galena has a visitor guide website at http://www.visitgalena.org. You can learn more about Deutschheim at https://mostateparks.com/park/deutschheim-state-historic-site. I would encourage all of you to check out your own state parks and historic sites this Christmas season. You might be surprised at the magical Christmas events they have to offer. Merry Christmas to all…and to all, good traveling! This is one of the very best ways I have found to use some of that leftover turkey from the holidays. It is easy to make, does not take much time, and is perfect for those evenings when you are busy, want to get dinner on the table in less than an hour, but still want a special and delicious meal. Melt the butter in a large skillet and add the garlic. Saute over low heat for 3-4 minutes. Stir in the flour, cooking for 2 minutes. Whisk in the turkey broth, lemon juice, salt, and pepper, and simmer on medium for 5-7 minutes. Add the bacon, turkey, dried basil, red pepper flakes, and the half and half. Simmer on medium heat for 10-15 minutes, or until everything is warmed through. 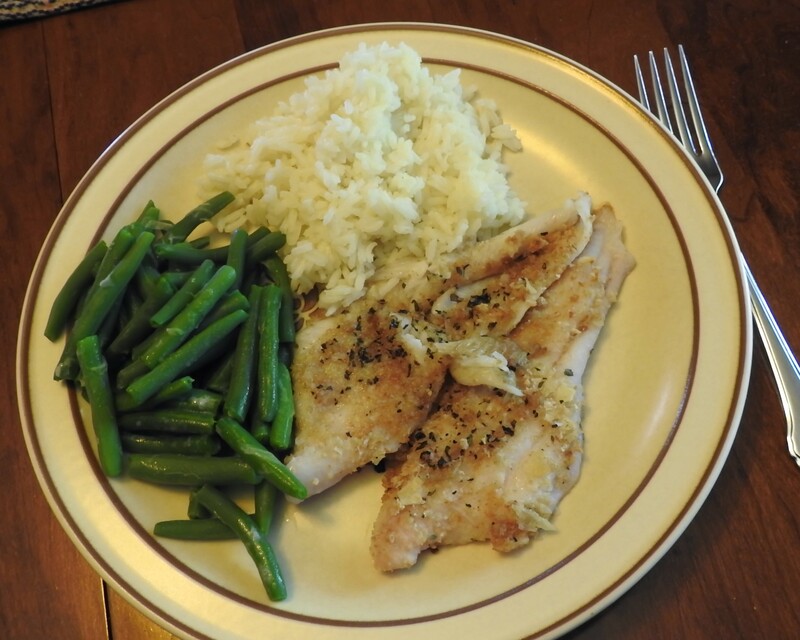 Serve over mashed potatoes or rice, either is great! *I make my own turkey broth from the bones of the turkey. If you do not have turkey broth, chicken broth will do fine in this recipe. Traveling north on US 63 as the fog lifts off the Gasconade River. —my husband, Jim, and I started out for Independence, and the home of our 33rd President, Harry S. Truman, and his wife, Bess. It was a beautiful drive across the center of the state, through farmland and small towns. We were on our way to visit the last of our Missouri National Park sites as listed on the NPS website. As our nation celebrates the 100th anniversary of our National Park Service, we decided to find our national parks…in our own backyard, our own state. What an experience it has been. We have learned so much, had so much fun, and have come away from our journeys with so much more appreciation of our nation, its natural places, its history, and its impact here and on the entire world. When we arrived in Independence, we stopped for lunch at Cafe Verona on the city square. The grate on the front windows was very intriguing, adorned with dozens of locks. I took a picture of them and posted them to my Facebook page. I was surprised when a friend commented that there is actually a tradition to locks on bars and fences. 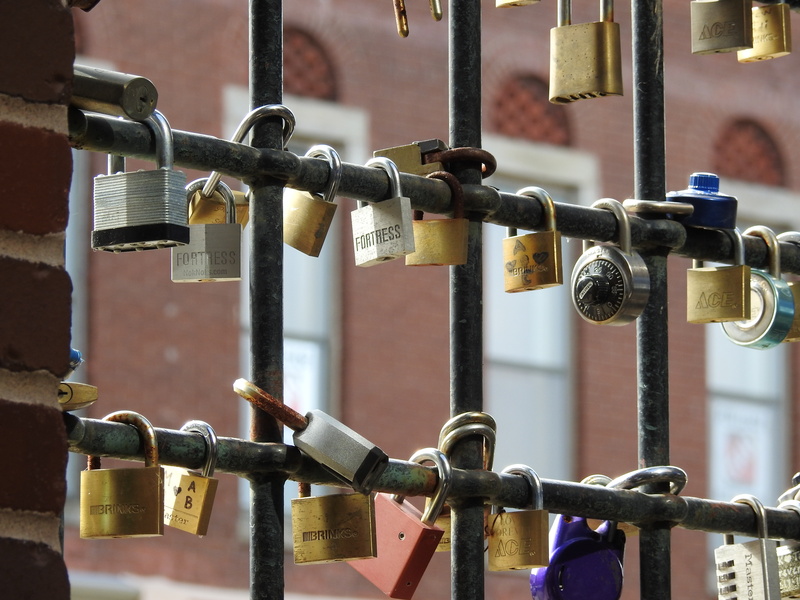 The lock is put on by loving couples to signify that their love is for no other, and will never end. Tokens of love on the window gates at Cafe Verona in Indepependence, MO. Our next stop was the Harry S. Truman National Historic Site Visitor Center. 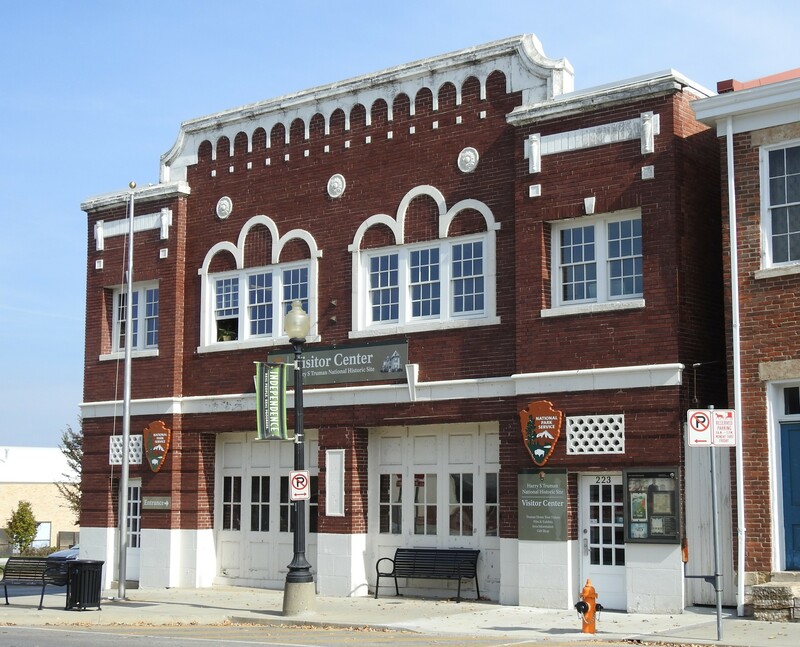 The Visitor Center is located at 223 N. Main St. There we viewed a film on Truman’s life in Independence and picked up our tickets to tour the house itself. The Truman home is at 219 N. Delaware St. My first impression as we drove up to the curb in front of the house was how much the area reminded me of the Midwestern neighborhood in Michigan in which I grew up, and how much it reminded me of the Midwestern neighborhood in which we raised our own five children. The house looked, and felt warm and inviting, like a place where a family really lives. Though Harry Truman and Bess Wallace had been acquainted since childhood, it was on a day in 1910, when Harry returned a cake plate from his cousins, who lived across the street from the Wallaces, to Bess’s mother that he fell head over heels in love. After a courtship of nine years, they were married on June 28, 1919, and moved into her family’s home. While living in the Wallace house in Independence, which became the Truman home after the death of Bess’s mother, Harry Truman opened and lost a men’s clothing store, was elected to two judgeships in Jackson County, lost one re-election bid, was elected to serve as a US senator from Missouri, and in 1944, was elected to be Franklin Roosevelt’s Vice President. While living on N. Delaware, Harry and Bess also welcomed a daughter, Margaret, their only child. Less than three months after assuming the Vice Presidency, and following the death of Franklin Roosevelt, Harry Truman was sworn in as the 33rd President of the United States on April 12, 1945. It would be many years before Harry and Bess could return to their quiet, Midwestern home in Independence, MO. But return they did, to the place they both loved best. It was amazing to me how normal a life the former first family was able to lead, though it did have its challenges. There had always been people who wanted to see the place “where the President lives.” The biggest intrusion on their quiet life had been the installation of a security fence to keep out the sightseers, especially those who thought it was okay to walk into the garden and pick one of Bess’s prized flowers. Some had even torn boards off the house. On one occasion, Bess discovered two “visitors” walking through the house! This fence was installed around the yard to keep “visitors” at a distance. Until 1963, and the assassination of John F. Kennedy, former Presidents were not given Secret Service protection…and Harry Truman, citizen, did not like it when it did come! Secret Service agents were installed in a house across the street, which is privately owned and inhabited today. They did not come into the Truman home without an invitation, and that was rarely extended. When you visit the Truman home today, you will see it just as it was on the last day Bess lived there. Their daughter, Margaret, helped the park service set the dining room table as her parents would have it set when the entire family was there to eat together. The same appliances, dishes, wallpaper, and furniture are just as they were. As you look into the library you will see the books each of them enjoyed. The yard has been kept as the Trumans preferred it… natural, with no fancy, formal gardens. And in the garage sits Harry’s last car, a Chrysler Newport. Each and every day, Harry Truman took a two mile walk around Independence. You can still follow in his footsteps as you follow the signs that mark his route. 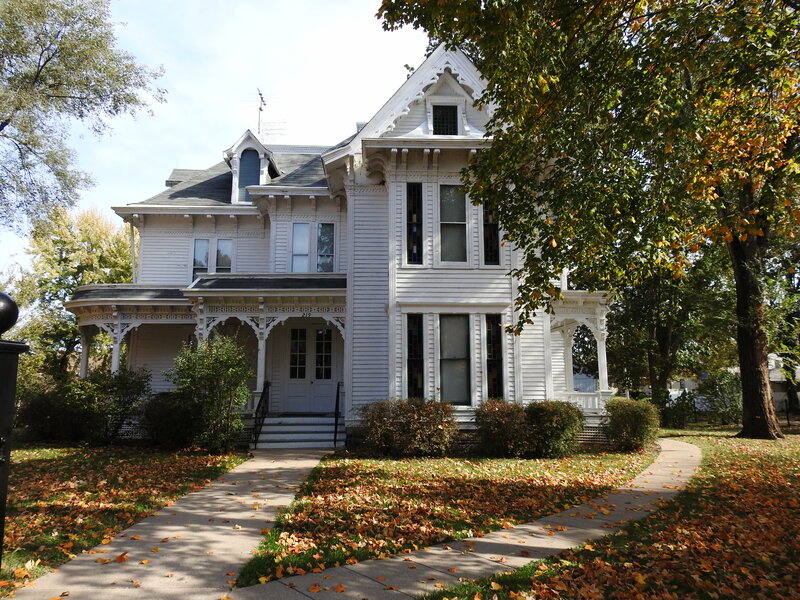 You can also visit the Noland Home across the street, where Harry Truman’s cousins lived. You can walk the streets of the neighborhood, just as Harry Truman did each and every day. Inside the Noland House, you will find displays relating to the lives of Harry and Bess Truman, and their Midwestern roots. 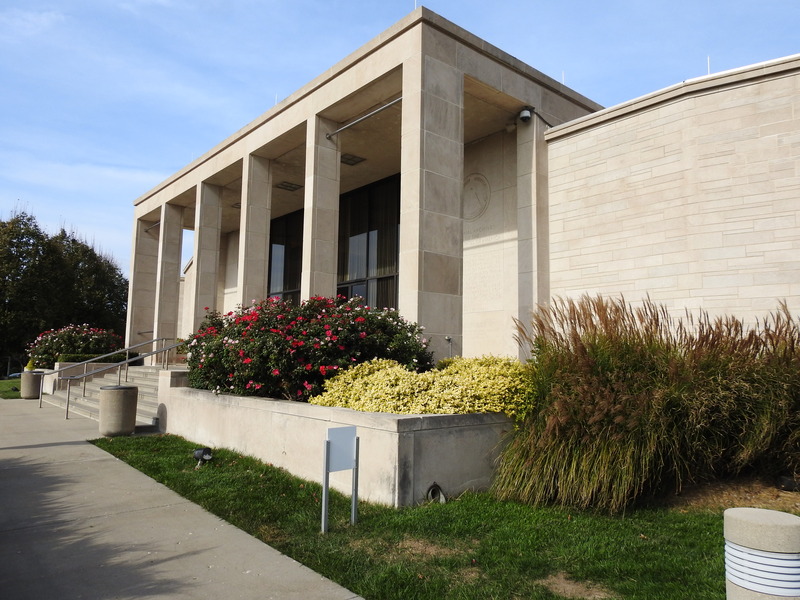 A visit to the Harry S. Truman National Historic Site would not be complete, however, without a stop at the Truman Library, just a couple miles away. The library is a marvelous place, with displays depicting the times of the Truman Presidency. Here are a few of the memorable things you will see on a visit to the library…. An eternal flame in honor of our 33rd President. This year spent visiting the national park sites in our own state of Missouri has been so rewarding. It has reminded us of how fortunate we are to live in this country, this place we call the United States of America. America is a homeland to cherish, even as we take stock of who we are as a people, learning from our mistakes, taking pride in our successes, and forever moving forward to create a better country, a better home for all of us, and all who want to become a part of us. So go on, get online, find the national park sites in “your own backyard”, and then get out there and discover your America. Have a great time while you are traveling, exploring, and learning, gaining a new understanding of your backyard, your own state, that one that you call home! It is said that when Harry felt homesick for Missouri and their house on N. Delaware Street, Bess would make him some Ozark Pudding. She would also often serve it for dessert to visitors at the White House. I must say, it is really easy to make, but tastes like it takes a lot more time than it does. It is not like a real pudding, but rather a gooey, puddingy cake (not sure about that word, puddingy, but it fits the dish perfectly. The top is like a crusty, browned meringue. When you break into it, it falls immediately, but don’t worry, that is what it is supposed to do. Bess would have served it warm with fresh whipped cream with a bit of rum added. We ate it warmed with vanilla ice cream, and it was absolutely delicious. There was something about it that tasted very homemade and comforting. 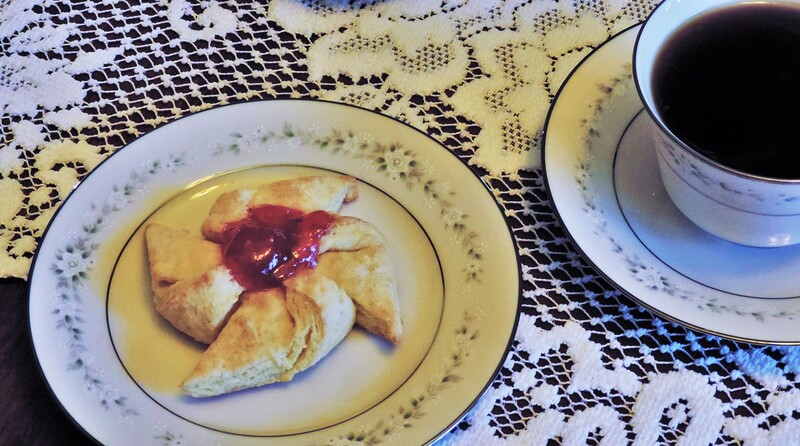 It reminded me of my childhood, eating at my Grandma’s house…love! Beat egg well with an electric mixer. Gradually add sugar, beating constantly until light and creamy. Sift together the flour, baking powder, and salt. Add to egg mixture, blending well. Lightly stir in apples, nuts, and vanilla. Pour into a greased and floured 1 qt. baking dish. Bake for 30 minutes. Serve with whipped cream or ice cream. Enjoy! As we have traveled around our state of Missouri, I have often wondered at the absence of the state’s history in the history books of our school systems across the nation. My husband and I both grew up in Michigan, went to college in Illinois, and taught in schools in Michigan, Indiana and Missouri. In all those places, in all those years, we never happened across curriculum that would inform our students, or even us personally, about the history of the Civil War as it related to Missouri. Nor was there any way for students to learn of the experiences of ordinary citizens within the state as they dealt with the consequences of the great divide between the North and the South. I have always believed that the failure to include the story of Missouri during the Civil War deprived us all of the opportunity to learn how the war affected Americans far-flung from the eastern states and eastern battlefields. The Civil War was fought across the nation with consequences still being felt today…across the nation. 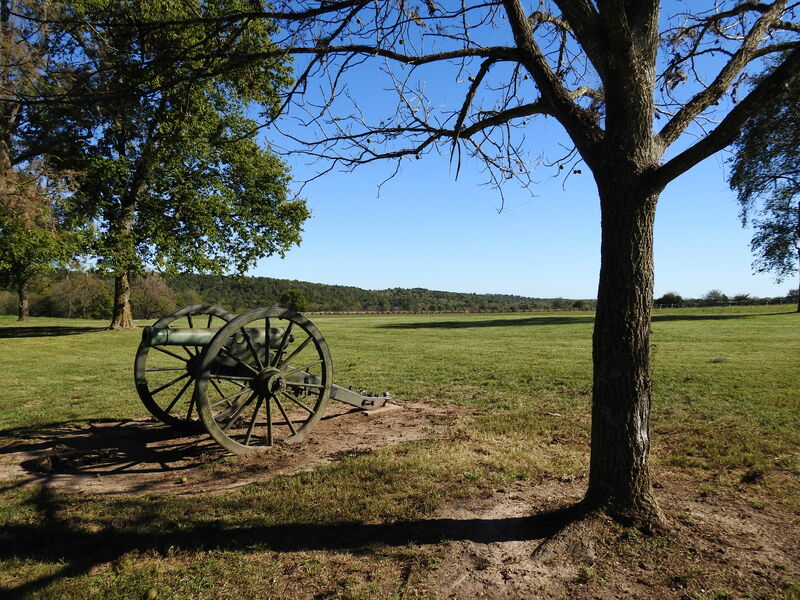 As we seek to visit all the national park sites in Missouri during the Park Service’s 100th anniversary year, we find ourselves at Wilson’s Creek National Battlefield in southwestern Missouri. We have taken our children there many times, helping them to better understand some of the things that happened in this state they call home, and to help them understand some of the things still happening in Missouri…both good and bad. We always sought to teach them that they did not simply live in a “fly-over” state, but one that was, and is, a vital part of America. A stop along the auto tour of Wilson’s Creek battlefield-Sigel’s Final Position. In 1820, Missouri applied for statehood as a slave state. In 1821, under the conditions of the Missouri Compromise, Missouri was admitted as a slave state, while, to maintain a balance between free states and slave states, Maine was admitted as a free state. But as time went by, and by the time the Civil War began, a majority of Missourians had voted to stay in the Union, and were willing to fight to preserve the Union. The governor of Missouri, Claiborne Jackson, however, sympathized with the Confederacy, and was in favor of secession. The Missouri State Guard, under the command of Maj. Gen. Sterling Price, was charged with the task of moving Missouri into the Confederacy. The stage was set for hostilities, and these hostilities would break out in battles near towns, as well as on fields and farms throughout Missouri. At the beginning of August, 1861, Maj. Gen. Price and his troops were camped just outside Springfield, MO. They were preparing to attack and capture Union troops positioned at Springfield. At the same time, Brig. Gen. Nathaniel Lyon, commander of the Union troops at Springfield was planning to attack and defeat Price’s troops in order to save Missouri for the Union. On August 10, 1861, Lyon and his combined forces of around 6,400 men attacked the State Guard forces, 12,000 strong, at Wilson’s Creek. While Lyon and his force of 4,200 men quickly overtook Price and his men, the follow up force of around 1,200, led by Col. Franz Sigel, was unsuccessful in its assigned flanking action. The ensuing battle lasted for more than five hours, on a field that would forever after be known as “Bloody Hill”. The advantage went back and forth between the Union and Confederate forces, but in the end, Sigel and his men fled, and Brig. Gen. Lyon was killed on the battlefield, the first general to be killed in battle in the Civil War. All totaled, the Union lost one of every four soldiers in the battle. “Bloody Hill”, where Brig. Gen. Nathaniel Lyon, along with 1,700 Union and Confederate soldiers lost their lives during the Battle of Wilson’ Creek. Victory in the Battle of Wilson’s Creek went to the South, but the Confederate forces were unable to pursue and totally defeat the Union army. Under the command of Maj. Samuel Sturgis, the Union troops were able to withdraw and maintain a position for the Union in the state of Missouri. The Battle of Wilson’s Creek has been called the “Bull Run of the West”, yet very few have ever heard of it. To further understand the impact that Missouri had in the War, it should be noted that Wilson’s Creek was not the only battle fought in Missouri during the Civil War. Missouri ranked third among all the states in the number of Civil War battles within its boundaries. The battles to preserve the Union were indeed not fought only in the eastern states. 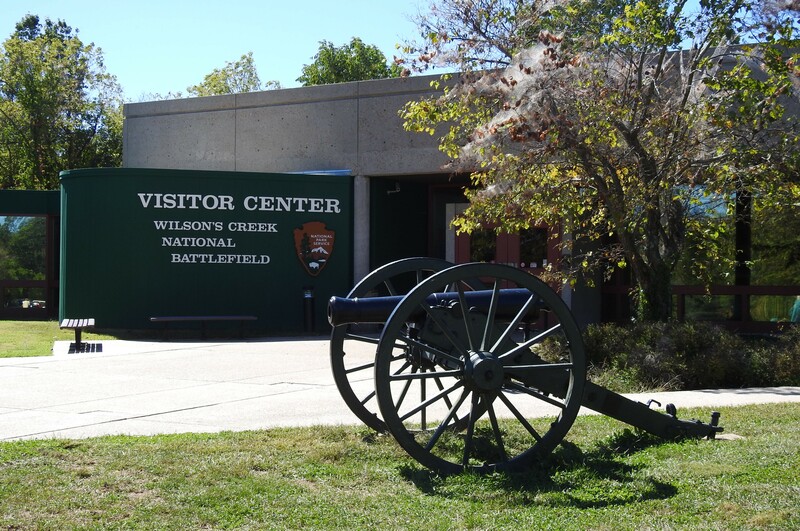 When you visit Wilson’s Creek National Battlefield, you will be able to take a 4.9 mile auto tour of its important sites. You will also be able to get a feeling of what it would have been like to be a civilian living in southwestern Missouri, confronted with a terrible war in “your own backyard”. Here are some of the sites you will see, and what you will learn from them. This is the site of Gibson’s Mill. 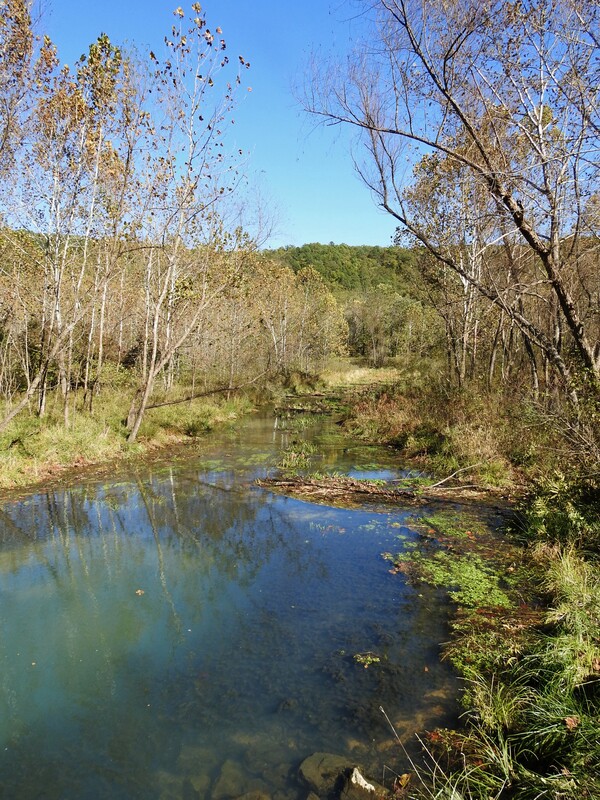 One can only imagine the turmoil people in the community felt when Southern forces set up camp next to the mill, and Union forces crossed over the creek at the site of the mill. 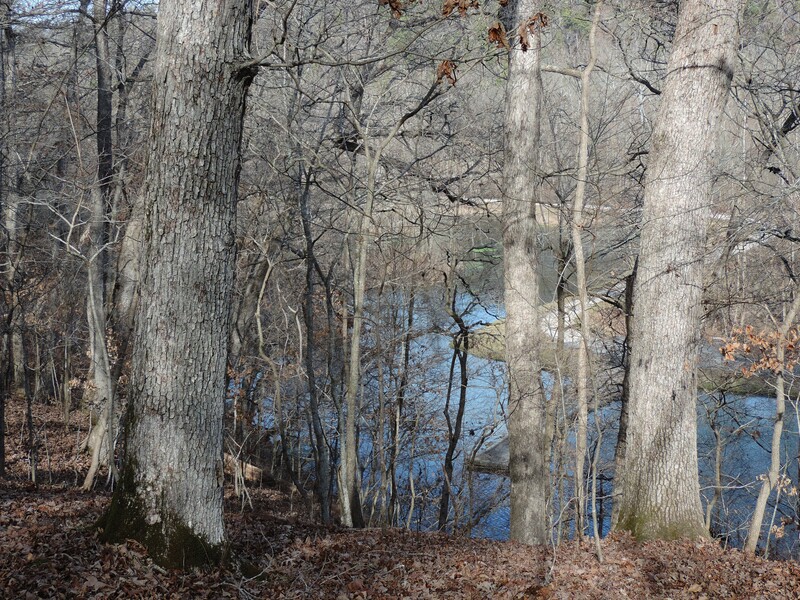 We followed the same path along Wilson’s Creek that visitors to Gibson’s Mill would have traveled in the days leading up to and following the Civil War. For years, the area around Wilson’s Creek had been home to many pioneers. They had come from the East, from the states of Kentucky and Tennessee to start a new, and hopefully prosperous, life on the fields of southwestern Missouri. The people living in the community would have walked to Gibson’s Mill for supplies, to learn of news from the outside world, and to visit with friends. It would have been a gathering place. Children of the area would have played outside, helped in the fields, and traveled to school. Families would have traveled to church services, and planned outings and picnics with other families of the area. One can only imagine the horror that filled them as they saw war break out around them, and the bodies of dead soldiers on their fields as a result of the battle. The beautiful and peaceful view from the front porch of the Ray house. The view would be marred by war. This small springhouse down the hill from the house was where the Ray’s would get water. It also served their needs for refrigeration. John Ray owned a house along the Wire Road, where he lived with his wife and nine children. Part of the battle was fought in his cornfield. During the battle, his wife, children, his slave Aunt Rhoda, and her four children all hid in the cellar of the house. During the battle, the Ray House became the field hospital. It was here that the body of Brig. Gen. Nathaniel Lyon was carried following his death on the battlefield. The events of that August day would live in the minds of this family for as long as they lived. Maj. Gen. Sterling Price set up his headquarters near William Edward’s cabin. The cabin you will find at the site is not the original, but one that was found about two miles down the Wire Road. It was uncovered when a house that had been built over it was being raised to make room for the construction of a new home. There are eight stops in all along the auto tour. In addition to pointing out the ways in which the battle affected civilians, you will find stops that explain the battle as it was conducted on the surrounding landscape. 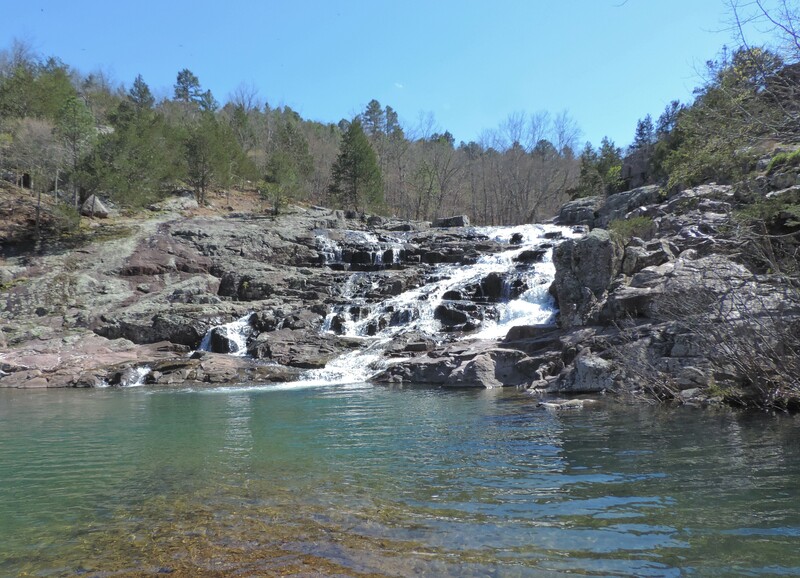 I hope you will take an opportunity to visit Wilson’s Creek if you ever find yourself in southwestern Missouri. It gives tribute to an important event in the Civil War, most of us know too little about. The Civil War was a fight for the survival of a nation, and it was a fight that was fought across the whole nation. 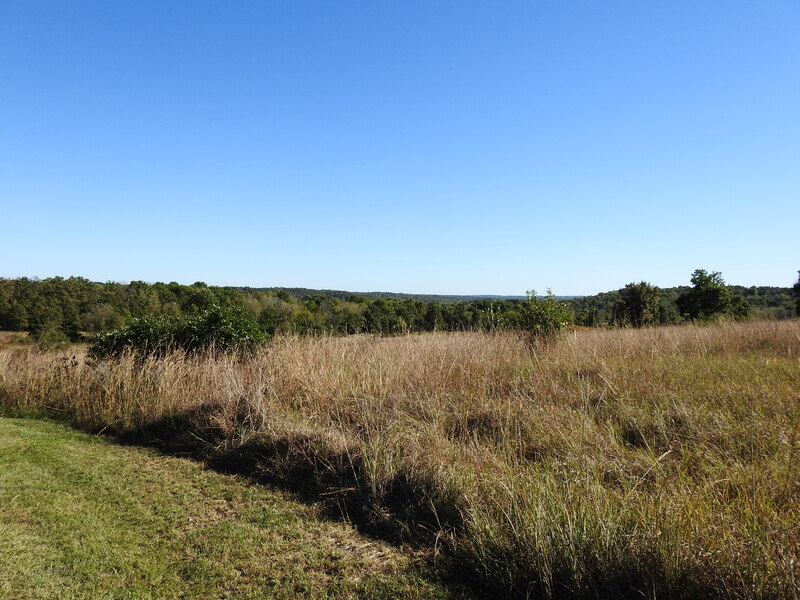 You can find more about Wilson’s Creek National Battlefield at its National Park Service website. 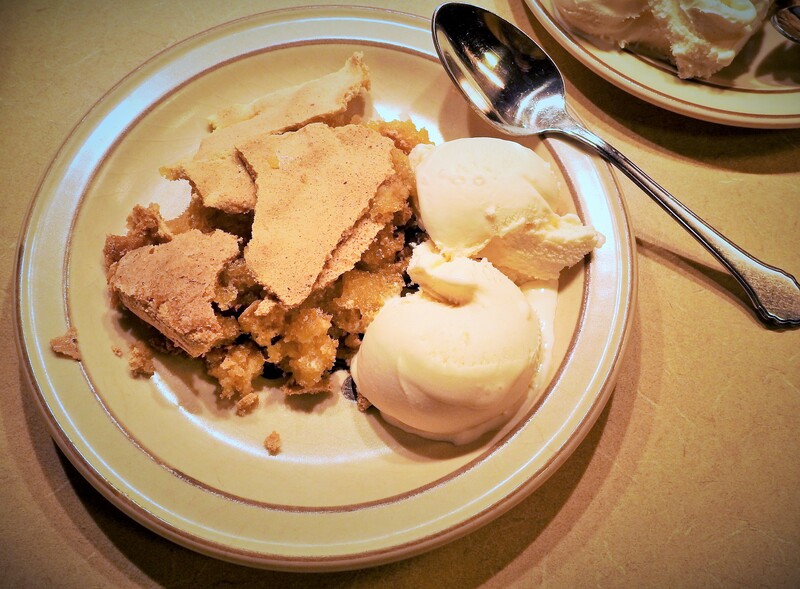 As I thought about the recipe I would use for this post, and as I stopped at the John Ray house and learned about his family, I could not help thinking about the time of year we have just begun. It is autumn, and with autumn comes harvest time. I could not stop thinking about the mountain of tomatoes I had left sitting on my kitchen counter when I left on this little trip. It made me think of Mrs. Ray, and the vegetables she would be getting out of her own garden. When I returned home, I decided to find a soup in one of my vintage cookbooks that would use many of my tomatoes, and thought maybe Mrs. Ray would have done the same with some of hers. I found one in “An Army Wife’s Cookbook”, a favorite of mine for many years. 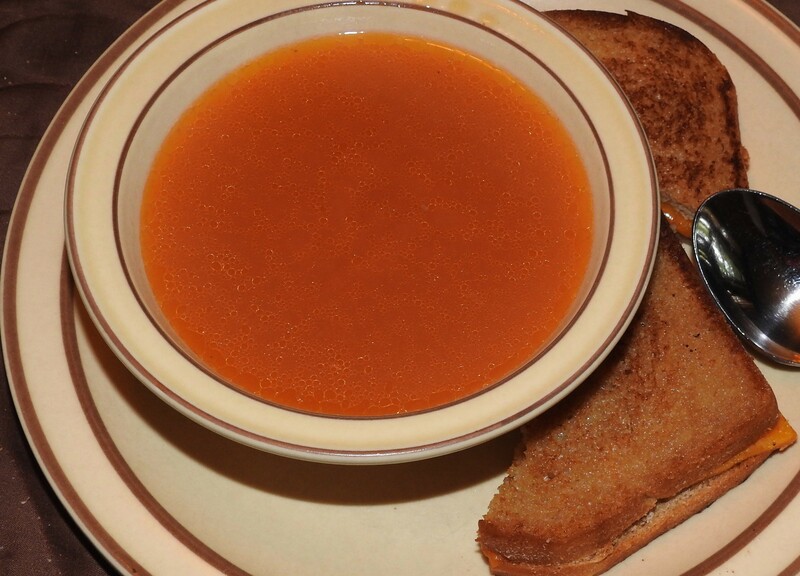 The recipe I am including in this post is adapted from that soup I found in the cookbook. This soup is not as thick as that you would get from a can, but it is oh so very tasty…Jim loves it, and that says a lot, because he is a very fussy eater. Served with Grilled Cheese Sandwiches and a salad, it makes a wonderful autumn meal. Boil the cut tomatoes, onion, carrot, and turnip together for about 1 hour. Strain. I pressed it a bit to get as much of the tomato pulp into the soup as possible. This should give you about 1 quart of tomato mixture. Put the tomato mixture and the beef broth together in a pot. Set aside. Melt the butter in a small pan, add the flour, and cook, stirring constantly until the mixture is brown and has a nutty odor. Add this mixture to the tomato and broth mixture. Add the sugar, the salt and pepper, and simmer for 5 minutes. *I make my own beef stock for this soup, because it does not have the dark color of store bought beef stock. This lighter broth allows the red of the tomatoes to be a beautiful characteristic of the soup. When I first began this journey to visit all the places in Missouri that are listed on the National Park Service website, I did so because I believed that, as important as it is to learn about our nation and its magnificent places, it is equally important to learn about that special place each of us calls “home”. My husband’s and my latest trip took us to the birthplace of George Washington Carver (my daughter asked me if he was the Peanut Man), in the little town of Diamond, population, 902. It is now one of my favorite national parks, and I can not figure out why I had not found it earlier. It is also special because I immediately related to the Carver quote above, about learning of your own “dooryard”. George Washington Carver was born in or around 1864, to Mary, the only slave of a farmer named Moses Carver, and his wife Susan. For the first two weeks of his life, he lived with his mother in a small cabin on the Carver property. 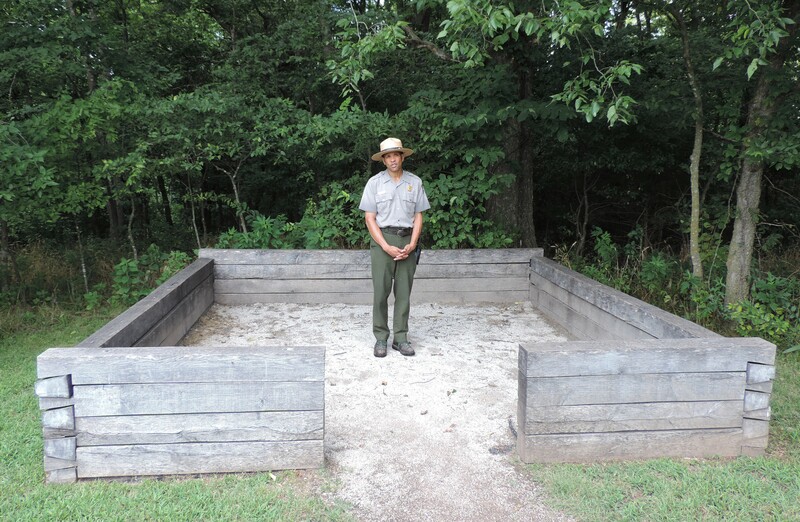 Our ranger guide agreed to stand inside the reconstructed layout of the cabin to give an idea of just how small this cabin was. The cabin in which George Washington Carver spent the first two weeks of his life. George was born during turbulent times in Missouri during the Civil War. When he was two weeks old, George and his mother were “ku Cluckeled”, kidnapped, by a band of guerrillas, and sold in Arkansas. Moses Carter sent someone out to find them and bring them back, but George was the only one he found. George never knew what happened to his mother. He lived with the Carters until he was between nine and eleven years old. They treated him well, and raised him in their own home. While he was living here, he loved to go out into the woods and the prairies nearby. He loved plants, and took every opportunity he had to gather them, study them, and experiment with them. Some people called him the “plant doctor” because so many plants did so well under his care. 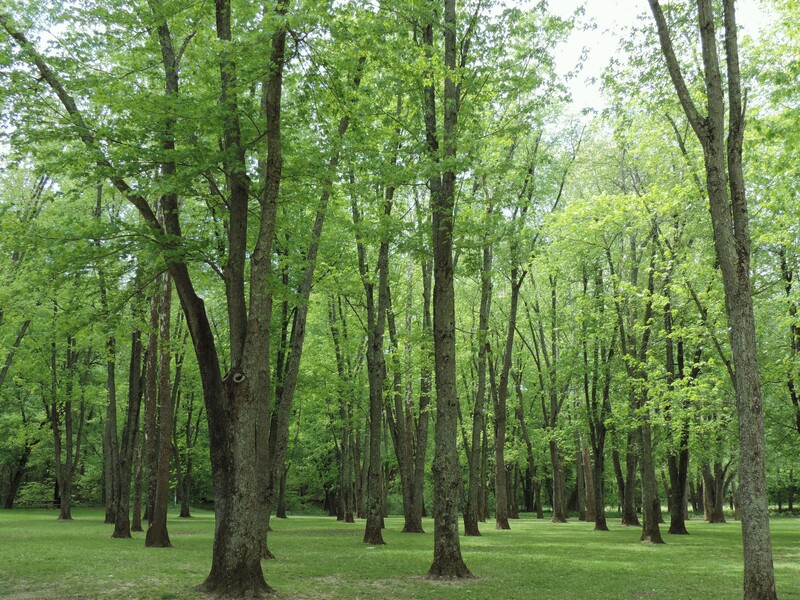 The woods which would be similar to where George played and learned as a young boy. Williams Pond, where George spent time playing with children from the extended Carter family. George would have spent many hours on the prairie near the Carver home. Because he was an African American, George was not allowed to attend the school in Diamond Grove, so he left the Carters to attend a school in Neosho, MO. There he lived with the family of Mariah Watkins, who nurtured and encouraged him in his interests, and in his thirst for knowledge. From Neosho, George went to attend school in Ft. Scott, Kansas, then on to study in Olatha and Paola, before he graduated from high school in Minneapolis, Kansas. He applied to study at Highland College, but was refused because of his race. George loved plants, but he believed that he loved to paint them even more. He had decided many years earlier that painting the plants he loved was what he wanted to do for all of his life. So, in 1890, George applied to, and was accepted to Simpson College in Iowa as an art major. His art teacher, Etta Budd recognized George’s great ability with plants, and encouraged him to study botany, which she believed would provide him a better standard of living than he would find in the art world. George enrolled in Iowa State Agricultural College in Ames, Iowa (today the school is known as Iowa State University), where he earned a Bachelor degree in Agriculture in 1894, and a Masters of Agriculture degree in 1896. After receiving his degrees, George accepted an offer from Booker T. Washington to head the Agriculture Department at Tuskegee Institute in Alabama. George Washington Carver realized his life’s dream of serving others during his years at Tuskegee Institute. He understood that growing cotton year after year was hard on the soil, that it made it less productive as the years went on. Through his study and his teaching, he was able to convince southern farmers to grow peanuts and soybeans to rejuvenate the soil, and save their livelihoods. He was an amazing man, with an amazing spirit, an amazing desire to help others, and an amazing understanding of the world around him. 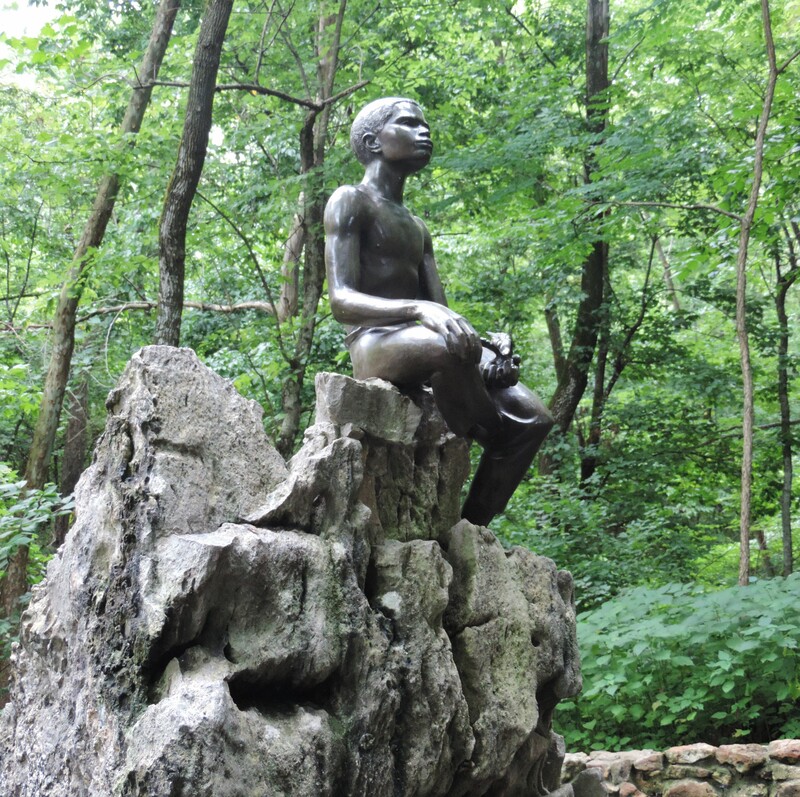 When you visit the George Washington Carver National Monument, you will find plenty to do inside and outside. The Visitor Center is a fantastic place with a museum, a museum store, and a theater which shows a film about Carver, his life, and his legacy. But the place in the Visitor Center that I love the most is the laboratory. It is used by school groups who come to do botanical experiments…George would be so proud! Across from the lab is a 1800’s vintage classroom to which students can come and learn about George Washington Carver and his contributions. A vintage classroom setting to help make learning fun! This wagon, kept in the museum, was used by George Washington Carver as he traveled around teaching southern farmers better farming practices that would replenish the soil and keep their farms producing good crops. A recreation of the house that Moses Carter built in 1881. George never lived in the house. and even more prairie flowers. The George Washington Carver National Monument is an extraordinary place that encourages us to be all that we can be, in the place that we are, with the gifts we have been given. Jim and I always encouraged our children to strive to be the best that they could be; this special place is the perfect place, with the perfect story, to drive that message home. George Washington Carver was an expert on peanuts. He was an expert in growing peanuts, and an expert in using peanuts. He discovered 300 ways to use a peanut, and in the 1930’s, he used peanut oil to bring comfort to polio patients by applying the oil as part of a massage treatment. 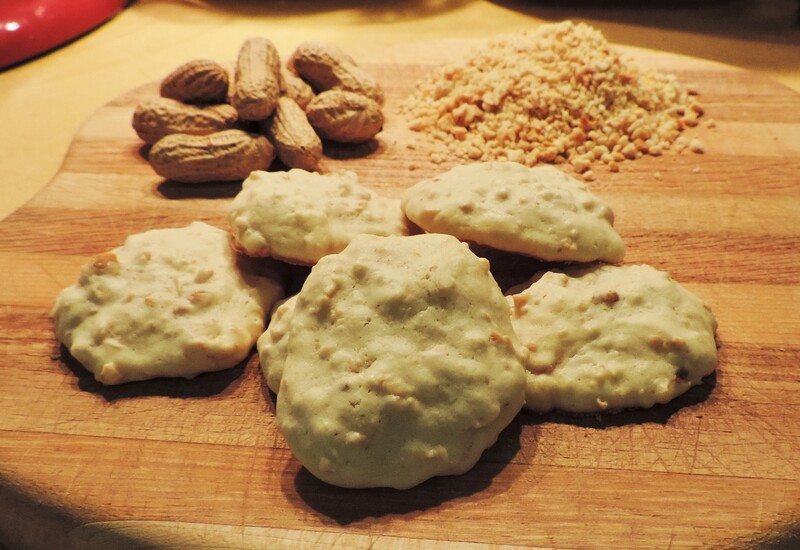 He experimented with peanuts, and created many recipes using peanuts. For this post, I chose Peanut Cookie #1. Because his directions are very general, I had to do some experimenting of my own! Cream together the butter and sugar. Add the beaten eggs. Measure out the flour and combine with the baking powder. Add the milk and the flour mixture, mixing well. Lastly, stir in the peanuts. Drop by spoonfuls onto a well greased baking sheet, and bake for 8-10 minutes. *I used my small food processor to grind roasted, unsalted, and shelled peanuts. **When I make these again, I will try a 375 degree oven, just to brown them a little more. In my last blog, posted on May 31, 2016, I introduced readers to the Trail of Tears National Historic Trail. The trail was established in 1987, as a memorial to the suffering of so many Native Americans when they were forcibly removed from their homes in the East to Indian Country, the area we now call Oklahoma. 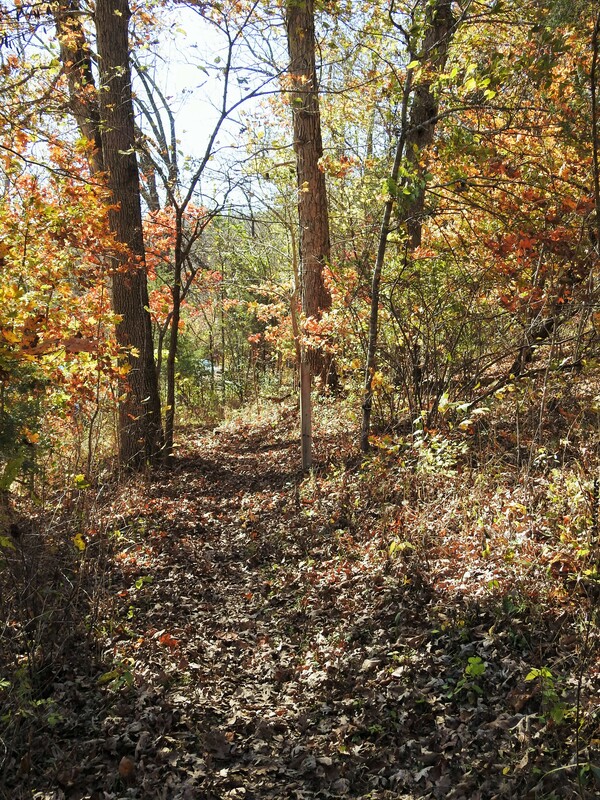 The trail runs through our home state of Missouri, from the Mississippi River in eastern Missouri to the Missouri-Arkansas border on the far western side of the state. We can actually walk in their footsteps, over the same paths they traveled. The trail serves as a reminder of a sad chapter in American history…one the likes of which we can never repeat. Our next stops take us to Bollinger Mill State Historic Site and Trail of Tears State Park, both of which are on the Trail of Tears, as we continue to visit the National Park sites in “our own backyard”. 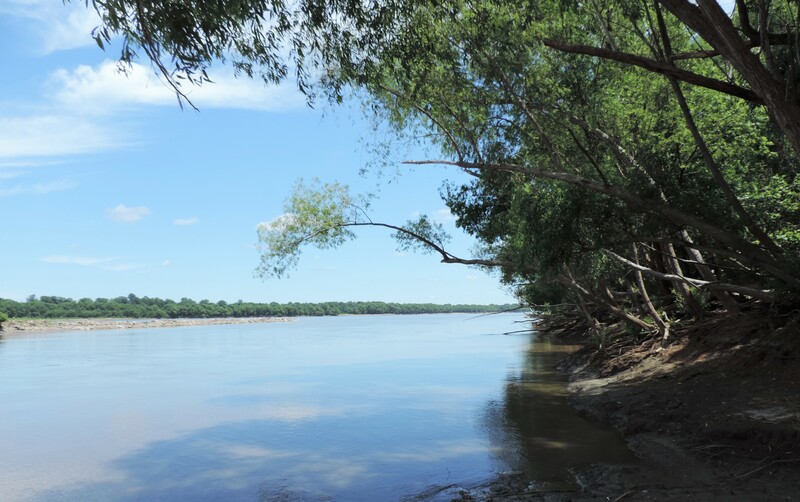 In 1800, a man named George Bollinger moved, with a large group of his relatives, from North Carolina to a spot on the Whitewater River in southeastern Missouri. Bollinger built a mill on the site, while the twenty other families in the group built farms along the Whitewater, the Little Whitewater, and the Castor Rivers. Over the years, a total of three mills have stood at the site. During the Civil War, the mill was burned by the Union Army to prevent the Confederates from obtaining flour or meal from its operation. Following the war, the mill was rebuilt with brick on top of the stone foundation that had survived the fire. Bollinger Mill went out of business in 1953. 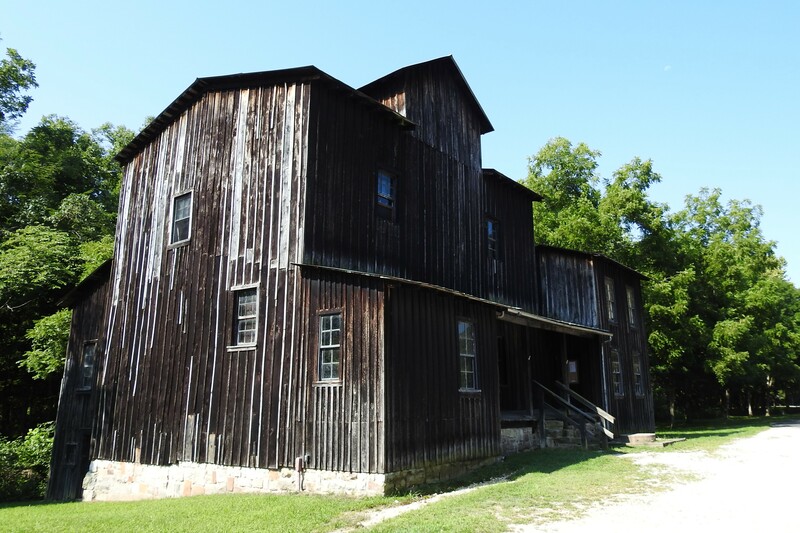 When the Cherokee people were moved through the area, the disbursing agent, John Reynolds, purchased supplies at Bollinger’s Mill. In front of the mill, in the picnic area, you will find an interpretive sign showing copies of receipts itemizing those purchases. The Burfordville Bridge over the Whitewater River. 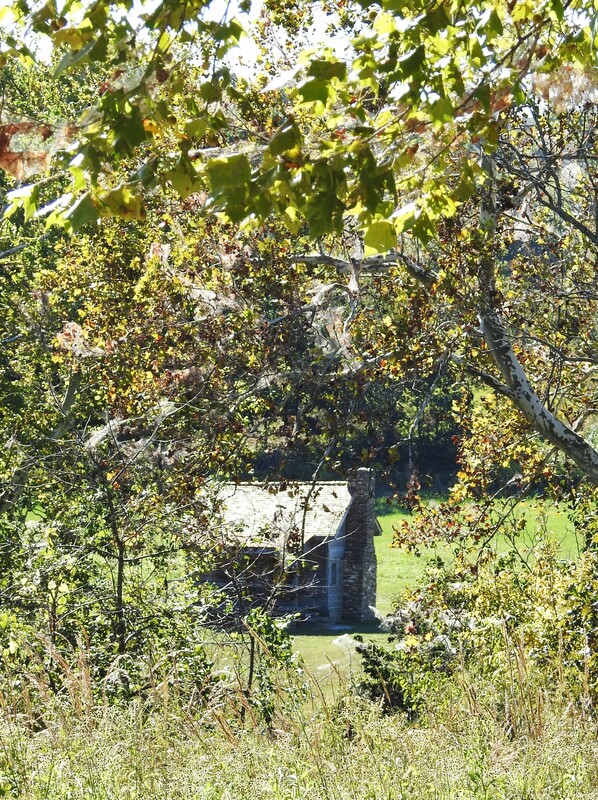 Next to the mill you will see the Burfordville Covered Bridge. It was built in 1858, and is the oldest of only four covered bridges that still remain in Missouri today. It is 140 feet long and spans the Whitewater River. The picnic area at Bollinger Mill State Historic Site. If you visit the mill today, you will find displays that explain the work of the mill during its many years of operation. You can walk across the bridge, which is now closed to motor vehicles. While walking across the bridge, see if you can find the plastic owl mounted on the ceiling. My husband and I are still wondering why it is there. And when you are done seeing the sites, you can enjoy a pleasant, and peaceful picnic lunch in a beautiful grove of trees along the water’s edge. 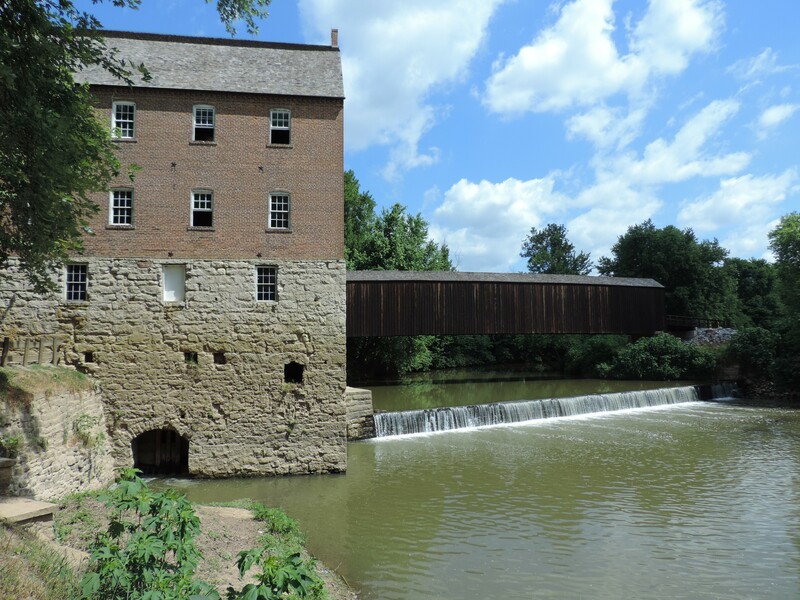 To learn more about the mill and the covered bridge, visit their website http://www.mostateparks.com/park/bollinger-mill-state-historic-site. Another view of the river as we explored the park. We visited Trail of Tears State Park, just north of Jackson, Missouri, on a beautiful, sun-drenched day in June. It was cooler than a typical summer day in Missouri, so we took a few short walks enjoying the bird song and the summer flora in the park. But Trail of Tears is also a haunting reminder of the tragic journey of the Civilized Tribes. Just across from the park, on the Illinois side of the Mississippi River is one of the two places the Trail of Tears entered the river to cross into Missouri on the way west to Indian Country. 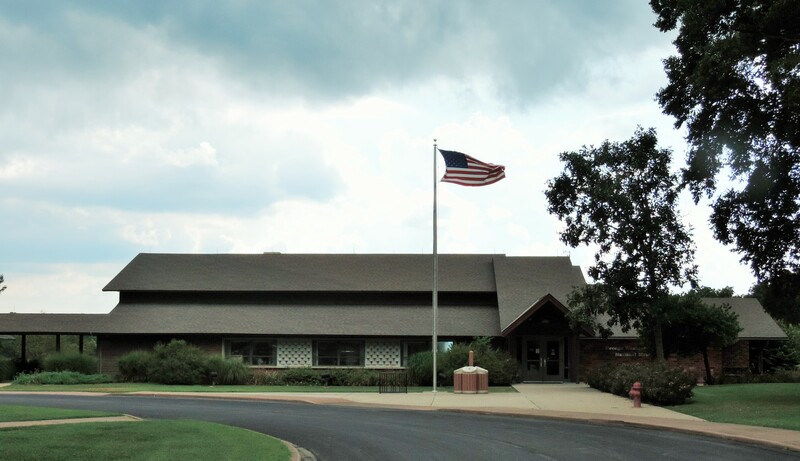 The Visitor Center has displays about the Trail of Tears and an informative movie on what it was, and why it happened. It is the same movie we saw at Meramec Spring Park, but it was certainly worth a second viewing. 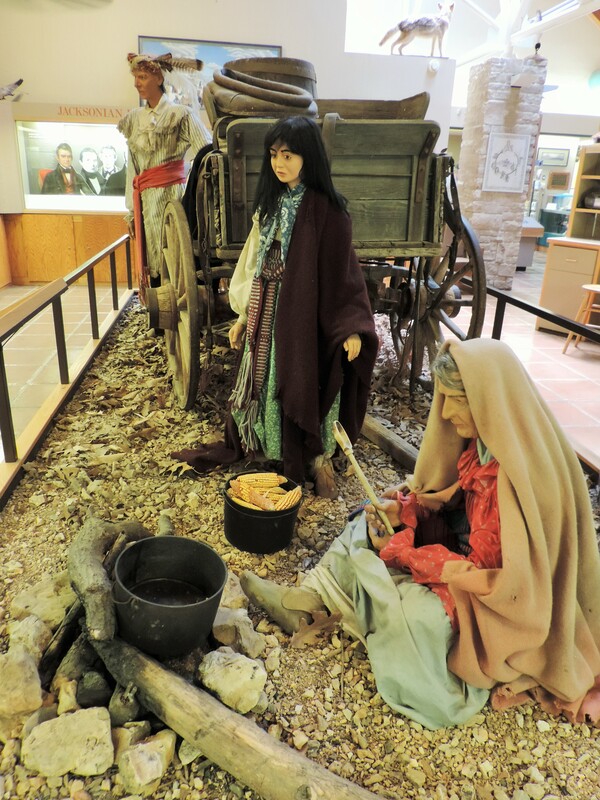 After crossing the Mississippi River, some of the Cherokees camped at Moccasin Springs, which is in Trail of Tears State Park, as depicted in this display in the Visitor Center. A boardwalk takes you to a beautiful view of the Mississippi, and a look back into history. The sign you see as you approach the boardwalk speaks of Louis Joliet and Father Jacques Marquete who passed by this place sometimes just after July 4, 1673, in canoes on the river. The purpose of their journey was to explore and determine the course of the Mississippi River. This boardwalk takes you to a panoramic view of the Mississippi River. The view along the boardwalk is stunning. This is sumac, and just beyond it is the view of the river. At the end of the boardwalk you will be looking across the Mississippi River to the Illinois shoreline, from which many Cherokee crossed into Missouri. There are stunning views of the river in which ever direction you look. As we were leaving the park, we visited the Bushyhead Memorial. When ice began to mount up on the river, the crossings were halted for a time. Those who had already crossed, camped in the December cold, waiting for the remainder of their group to join them. They were under the leadership of Reverend Jesse Bushyhead. His sister, Nancy Bushyhead Walker Hildebrand, died during that cold winter, and she was buried in the park. The memorial was placed in the park to honor her life, as well as the lives of all the Cherokee who lost their lives along the Trail of Tears. Our National Parks are a national treasure. We find in them relaxation, renewal, a call to nature, and sometimes we are called to recall our national history…the good and the bad, the joyous and the tragic. The Trail of Tears National Historic Trail is one of those park sites that should make us stop and think, to reflect on some of our past that is not so heroic, not so commendable. But in so doing, we should not despair, but we should look forward, and pledge to do better, to learn from our mistakes, to become a better people, to make this an even better nation. 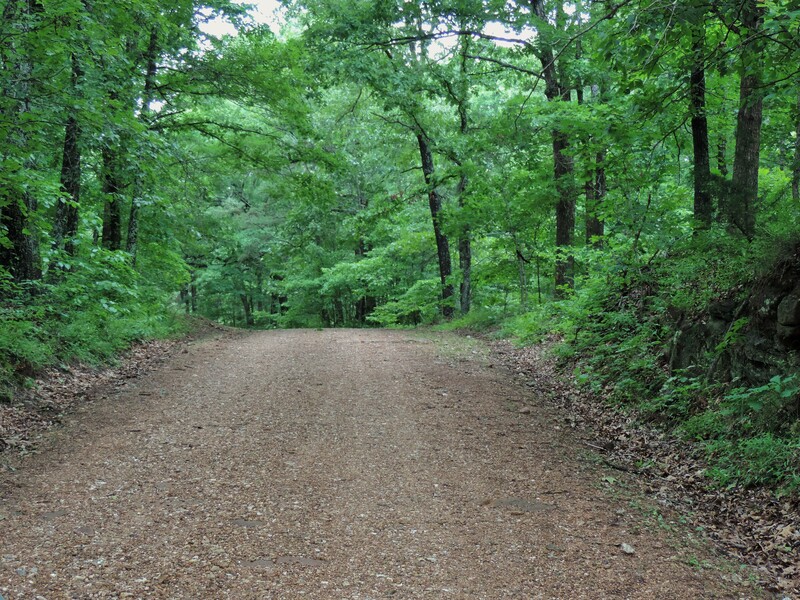 You can learn more about Trail of Tears State Park at their website, http://www.mostateparks.com/park/trail-tears-state-park. 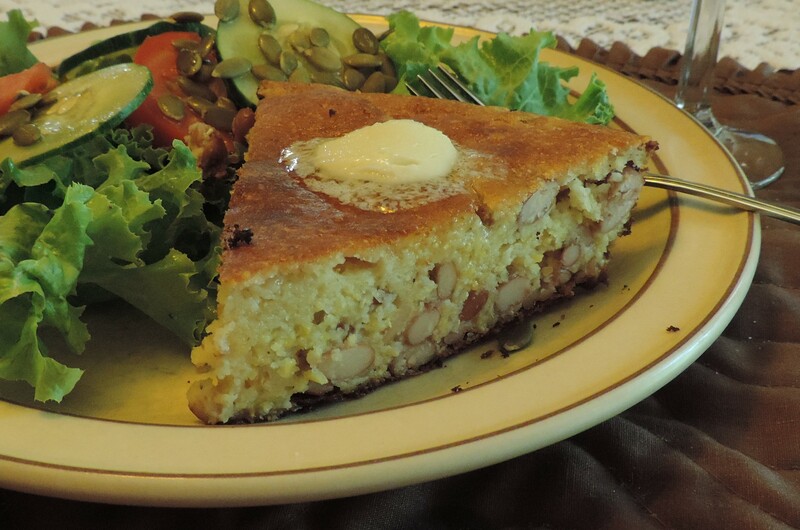 I found this bean bread on a site that featured Cherokee Indian recipes, and adapted it slightly. It is delicious, and makes a perfect meal when served with a big fresh salad, a big pat of butter, and a glass of white wine. Enjoy! Preheat your oven to 450 degrees, and put a greased cast iron frying pan in to get it nice and hot. Drain all the liquid off the beans. Mix all the ingredients except the beans thoroughly. Fold in the drained beans. Pour into the hot skillet and bake for about 30 minutes, until golden brown, and a toothpick inserted in the center comes out clean. One of the saddest and most shameful moments in American history was the forced removal, by the United States government, of the Indian tribes who populated parts of the eastern regions of our nation from the Ohio River into Georgia. The Cherokee Indians, along with the other Civilized Tribes, the Seminole, Choctaw, Chickasaw, and Creek, had for many years sought to heed the invitation of the Americans to live in a civilized manner, just as the American citizens themselves lived. The Cherokee people instituted their own court system, built schools to educate their children, took up farming as an occupation, established their own newspaper, and created their own written language. They were, while also holding true to their own traditions and beliefs, living the typical American life. But as time went on, the ownership of Native American land was threatened by the insatiable desire of white American citizens to move further and further west, and claim more and more land for homesteads. 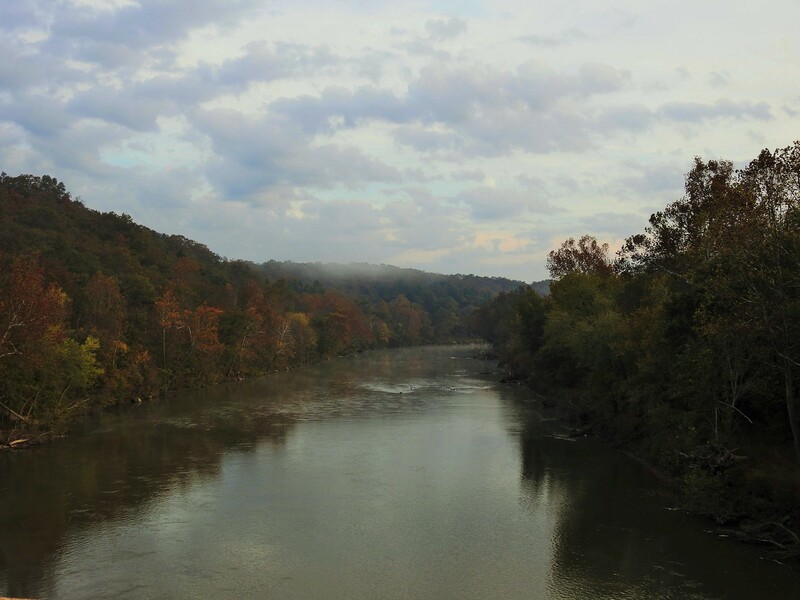 This desire for land was made even worse for the Cherokee living in Georgia when gold was discovered in the area, and miners paid little heed to those who owned the land, lived on the land, or were sustained by the land. These settlers and miners were attempting to live their own personal American dream, and the Native Americans were in the way! As more and more land was taken from the various tribes, the Cherokee people went to the United States Supreme Court for help. In spite of the fact that the Court ruled in their favor, the President of the United States, Andrew Jackson, sided with the state government and initiated a forceful removal of the native peoples far to the west, to Indian Territory, in what we now call the state of Oklahoma. Today, the journey the Cherokee were forced to take is called the Trail of Tears. In 1987, the United States government established the Trail of Tears National Historic Trail to help us remember this important time in our history, to learn from it, and to keep us mindful of the fact that it must never be repeated. Part of that trail runs through our home state of Missouri, and that is our next stop in our effort to visit all the national parks in our state. 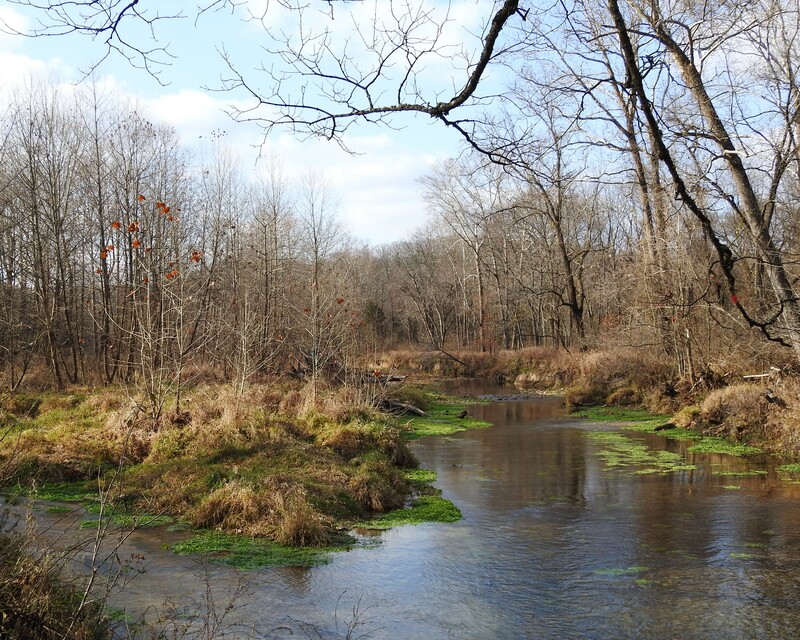 We begin near St. James, Missouri, close to Meramec Spring Park, and not too far from our home. The Snelson-Brinker house is the oldest house in Missouri’s Crawford County. Built in 1834, by Thomas Snelson and his son Levi, it served as a trading post, as well as being the first courthouse in the county. 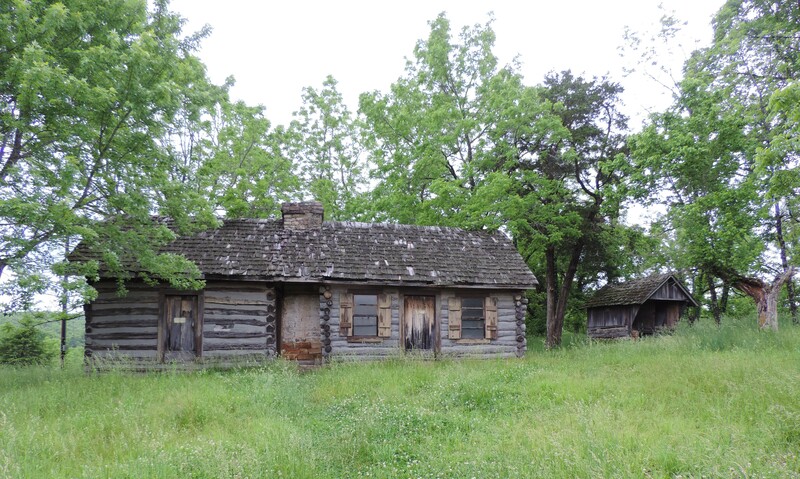 In the years 1838 and 1839, several detachments of the Cherokee people stopped at the house and camped on the property as they moved toward the Indian Territory. The Cherokee family of Richard Taylor, with a total of four members, died while on the grounds, and were buried in the Snelson family cemetery. 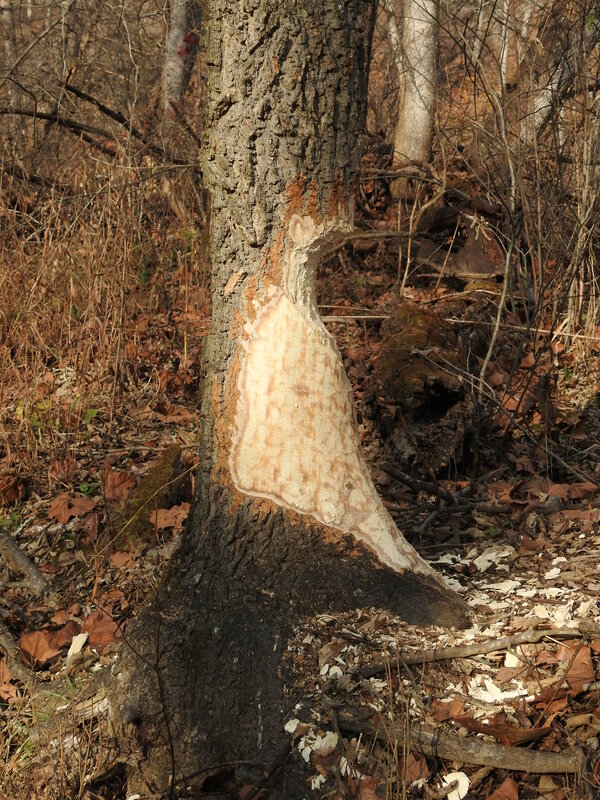 Today, you can visit the property, now adjacent of the Woodson K. Woods Conservation Area, on Missouri Highway 8. It looks much as it did when the Cherokee saw it, and my husband I wish that it was a bit better taken care of. It is, however, a haunting place, one that when understanding its history, will not soon leave you. Meramec Spring Park is a little further west along Highway 8. Meramec Spring Park is not a new destination for our family…we simply love the place! I wrote about our family’s history with the spring and park in a blog on May 23, 2014. But it is also a place located along the Trail of Tears National Historic Trail. In 1825, Thomas James and Samuel Massey moved to the Meramec Spring area in central Missouri to open an iron works facility. Iron was used in making the essential tools used on the farms, and in the homes of early America. By producing it in the midsection of the growing nation, it could be sold at a much lower price, avoiding shipping costs. The large red rock pit the men found near the spring (a source of water), and the large wooded expanses (a source of fuel for the fires in the furnace they would build), assured the two men that this site was the perfect place for their iron works. The red rock of the iron pit at Meramec Spring Park. In addition to the red rock in the foreground, you can see the deep forested expanse typical of this part of Missouri. The wood from the forest was essential in the production of iron at the iron works. 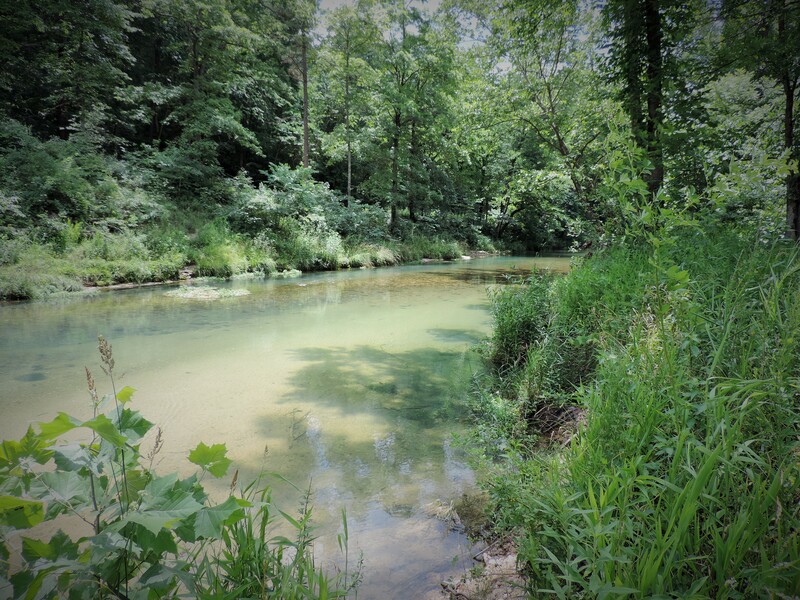 So, from 1827 through 1876, the Meramec Iron Works was in operation at what is now a beautiful park, renowned trout fishing destination, and treasured artifact site of things from long ago-it is a part of our Missouri heritage. 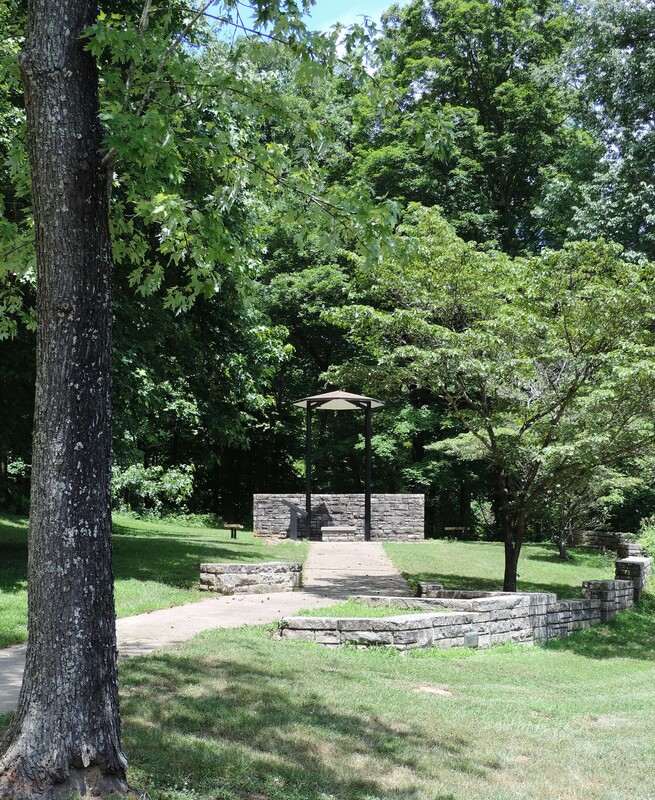 When you visit Meramec Spring Park you will see the preserved relics of the iron works, as well as having the opportunity to visit the museum. Exhibits in the museum explain how the work was done, who the people were who lived in and around the iron pit, and information about the natural flora and fauna of central Missouri. These sign posts indicate where individual activities important to the production of iron were located. A map, obtained at the Museum will explain the function of each. This furnace is where the ore that was taken from the pit was melted down. The bloomery was where the “pig” iron, taken from the casting beds from the furnace, was remelted to prepare it to be pounded into ingots. When you drive the historic trail at the park, you will find not only the open ore pit, but also evidence of the lives of the people who operated the iron works. It is a beautiful, quiet, and memorable drive. Meramec Spring Park is included in places to see along the Trail of Tears National Historic Trail because the Cherokee people, taking the northern route of the trail, stopped here to rest and camp on their journey from the eastern United States to Indian Territory during the years 1838 and 1839. When you visit the museum, you will be able to see a very excellent film, produced by the National Park Service, on the Trail of Tears…how it happened, what it meant, and how we should learn from it to become a better nation going forward. You can learn more about visiting the Trail of Tears National Historic Trail at its National Park website by clicking on the link. You can find help planning your visit to Meramec Spring Park by clicking its link. As you Find Your Park in this National Park Service anniversary year, I welcome you to visit our sites in Missouri, and I encourage you to visit other sites along the trail…to take some time to learn more about our national history by learning more about the Trail of Tears. 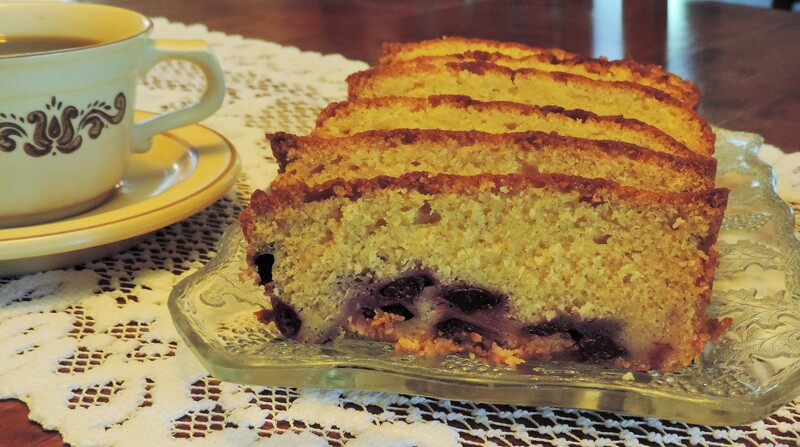 The Cherokee would have made this loaf cake with huckleberries they gathered in the southeastern United States, before their removal to Indian Country. Huckleberries and blueberries are members of the same family, and since we do not have huckleberries here in south-central Missouri, I used blueberries from my freezer, picked last summer just south of my home. Though I did add the extra tablespoon of flour to my batter, the blueberries still sunk to the bottom. But that was okay with me…this bread is very most and absolutely delicious. It is the perfect morning snack while reading, planning a new adventure, or just because I am hungry! Cream together the butter, sugar and honey. Beat in the eggs and the milk. Sift the 1 1/2 cups of flour with the baking powder and salt, and add it to the mixture, combining it completely. Mix the remaining 1 tablespoon of flour with the berries, and gently fold them into the batter. This is to help them stay suspended in the batter…as noted, it did not work in my cake. Perhaps you will have better luck! Pour the batter into a 9×5 loaf pan and bake at 375 degrees for 1 hour, or until a knife inserted in the center comes out clean. Enjoy! 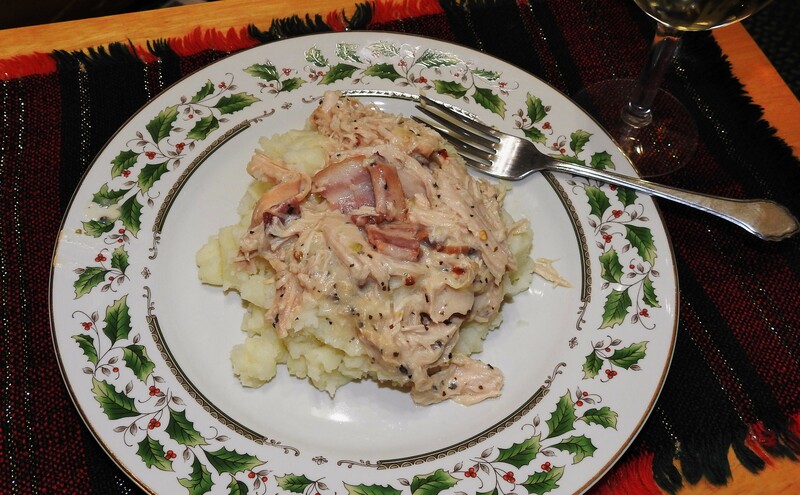 *This recipe is adapted from a favorite cookbook of mine that I purchased at the Native American Museum in Washington, D.C. It is entitled “Spirit of the Harvest: North American Indian Cooking” by Beverly Cox and Martin Jacobs, and was published by Stewart, Tabori & Chang. There is no place like Missouri in the springtime, and in springtime Missouri, there is no place any more beautiful than Ozark National Scenic Riverways. So, that is where our next trip takes us as we travel to the special places in our home state that have been set aside to be protected and managed by the National Park Service. 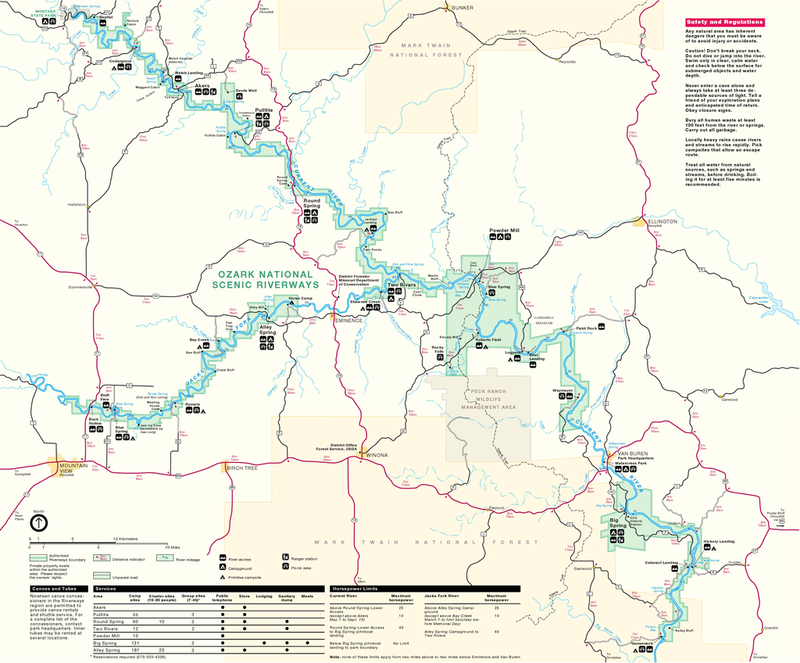 Deep into southern Missouri you will find a jewel of the Missouri Ozarks, the land where two crystal clear rivers, the Current and the Jacks Fork, flow to make up the Ozark National Scenic Riverways. This national park was established by Congress in 1964, and dedicated in 1971, becoming the first river system to be managed and protected by the National Park Service. 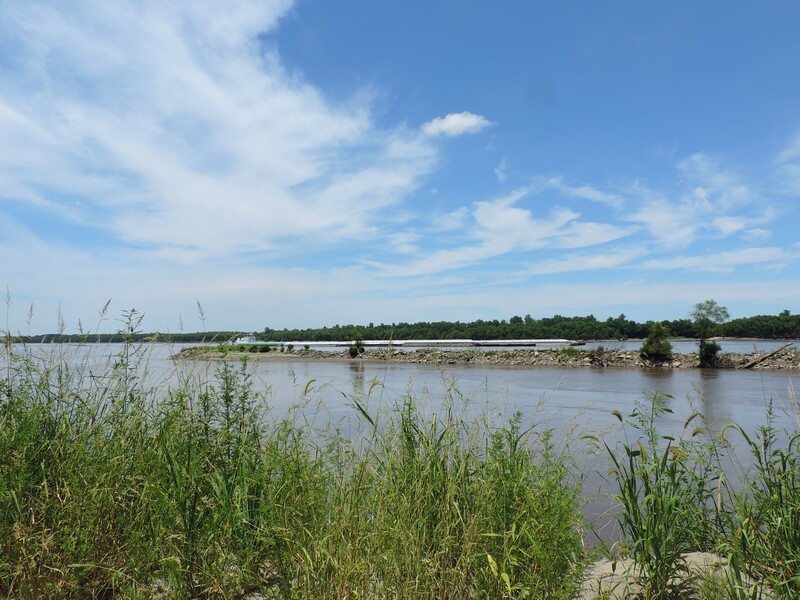 The establishment of this riverways park would ensure that the two rivers would be allowed to remain in their natural state, and that they would never be dammed. And thank goodness, because they are beautiful, they are inviting, and they are invigorating…a day spent anywhere in the park will just plain put a smile on your face. 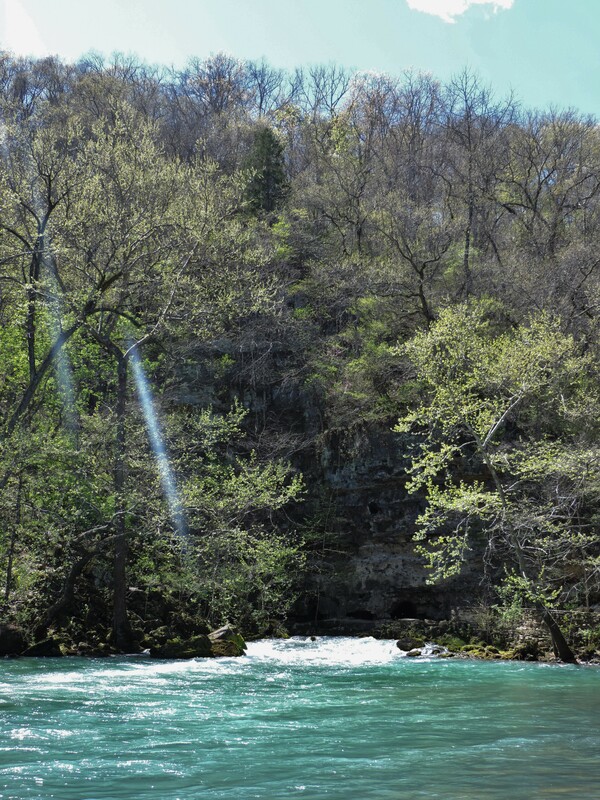 A few weeks ago, Jim and I traveled to the Ozark Riverways to spend a beautiful spring day at the springs. We began our trip by visiting the park headquarters and the Visitor Center which sits atop a bluff overlooking the Current River in Van Buren, MO. This bluff at the park headquarters overlooks the Current River. There is a hiking trail behind the visitor center that runs along the top of the bluff as it follows the river. We had a picnic lunch under these very tall shortleaf pines. Our first stop took us to Big Spring, not too far south of the headquarters. Big Spring is Missouri’s largest spring. With an average daily flow of 286,000,000 gallons, it is one of the largest springs in the world. When you approach the spring, you are instantly taken in by its deep aquamarine color. If you would see this color on a television spot, or in a photograph, you would truly believe it was a touched-up rendition. When I first saw it, I thought it was caused by the depth of the spring. But what causes this intense aqua color is actually the minerals within the water. The water gushing from Big Spring as it rushes to feed into the Current River. There is a trail that winds through the Big Spring Area, and at one point, goes behind the spring, and then leads up a rocky stairs to the trail atop a bluff. The Big Spring Area is visited by a wide variety of animal life. I caught a picture of this swallowtail butterfly. Big Spring has a visitor information center, a picnic area and a camping area. There are also cabins and a dining lodge, built by the CCC in the ’30’s which are presently closed for renovation. Most of the rock you will find in the Ozarks is sandstone and limestone, softer rocks which are dissolved over time by the action of water. But where you find Rocky Falls, the rock is rhyolite, which is harder and dissolves more slowly. So, this slower dissolving rock creates less space for Rocky Creek to flow, and you get this waterfall effect as it moves from one wider valley to the next. This area is called a “shut-in”. Regardless of how you explain it, it is a very pretty spot, especially in springtime, after a good rain. We did move on to our next stop, Alley Spring, one of my favorite places in the state of Missouri. 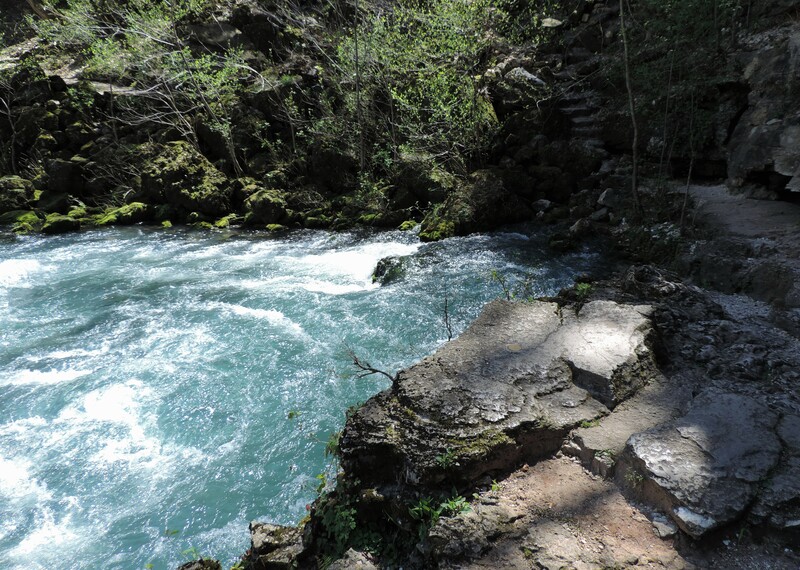 We hiked around Alley Spring, which has an average daily flow of 81,000,000 gallons. 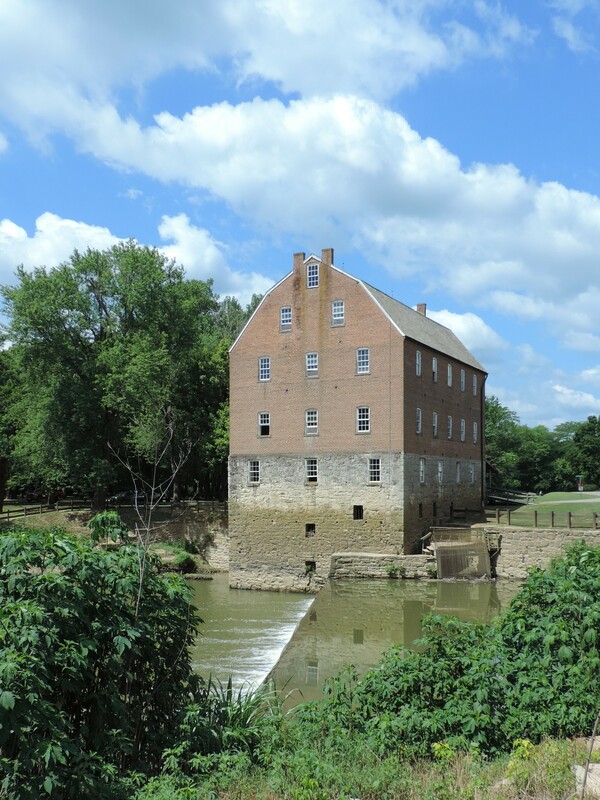 It is a pleasant, easy trail, with many different views of the spring and the old mill, which is the focal point of the site. 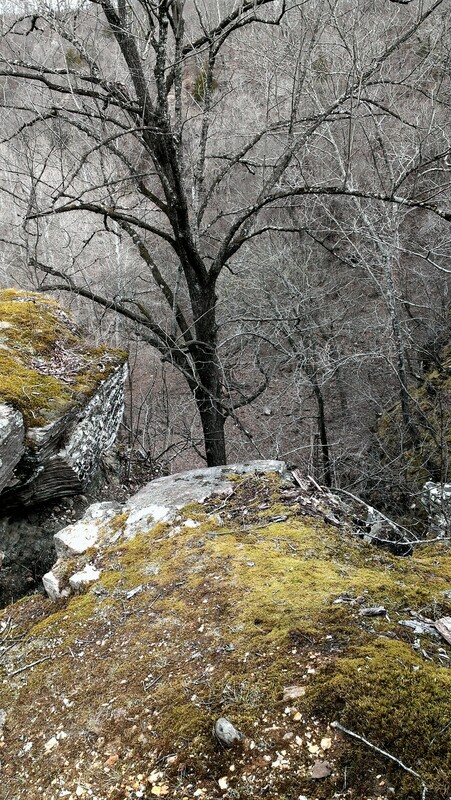 On the trail, you will pass around and, sometimes, duck under large rock outcroppings. Alley Spring was once a thriving mill town. 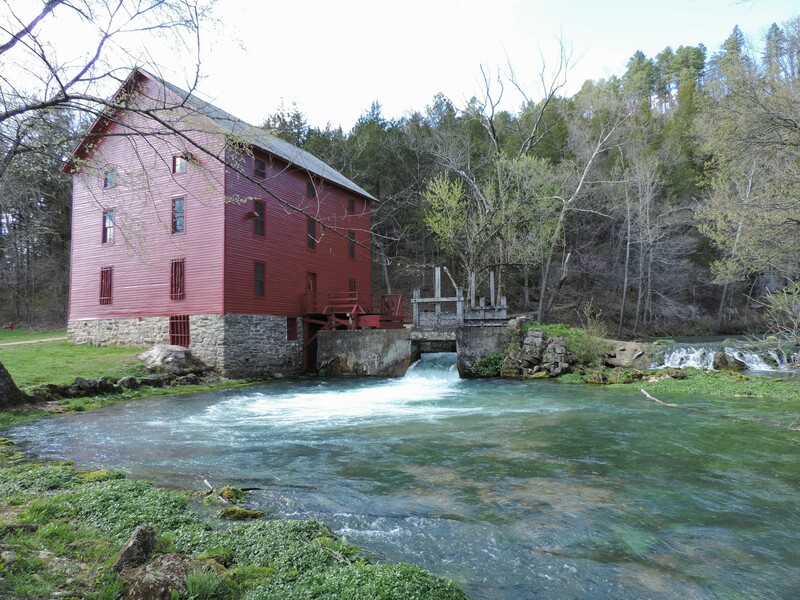 The mill you see today at Alley Spring was built in 1894 by George Washington McCaskill. 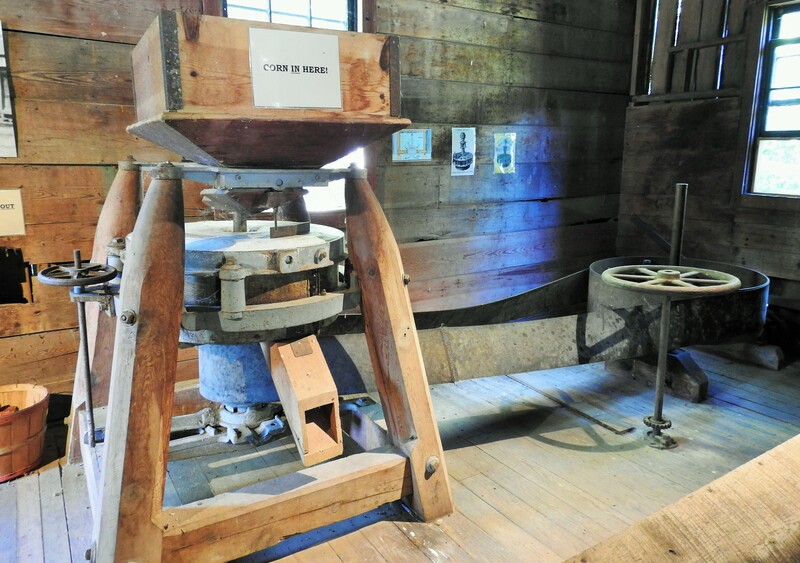 It used steel rollers for grinding wheat and corn for the residents of the community. No other buildings from the original town are still on the national park grounds. Several years ago, Jim and I visited the Story’s Creek School, which has been moved onto the Alley Spring grounds. It is a one room school house that was used into the 1950’s. Story’s Creek School, which in 1903, had 42 students. Church services were also held in the school. The interior of the school. 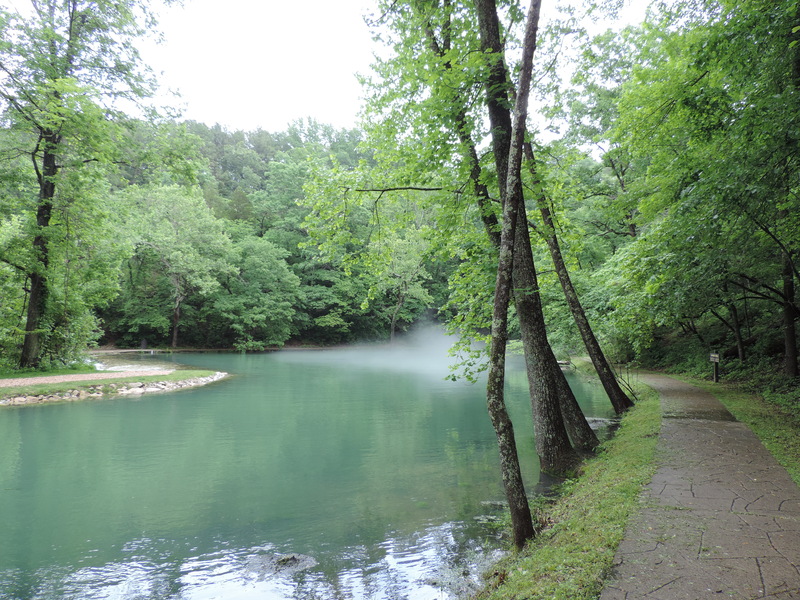 Our last stop on our trip to the Ozark Riverways was to Round Spring, which is just as the name suggests, round…and it is a very intense aqua blue. 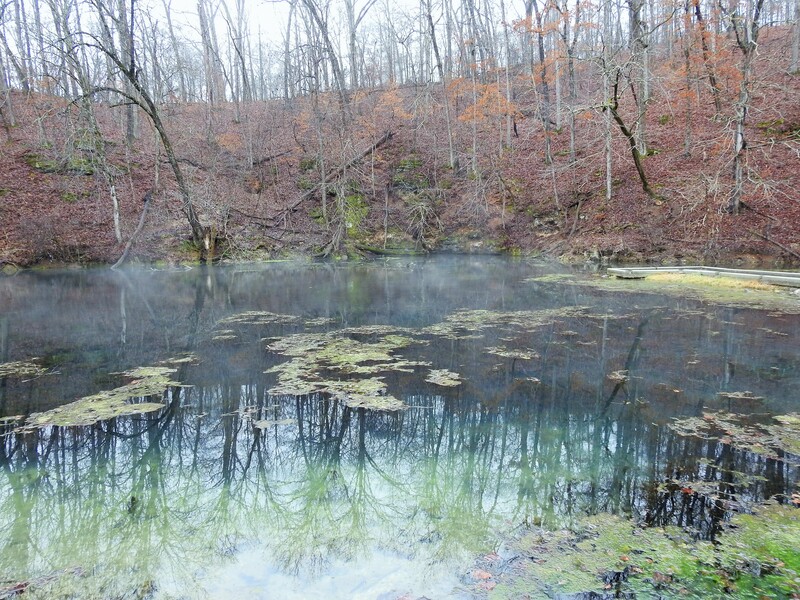 As with the other springs in the area, Round Spring maintains a water temperature between 55 and 58 degrees. 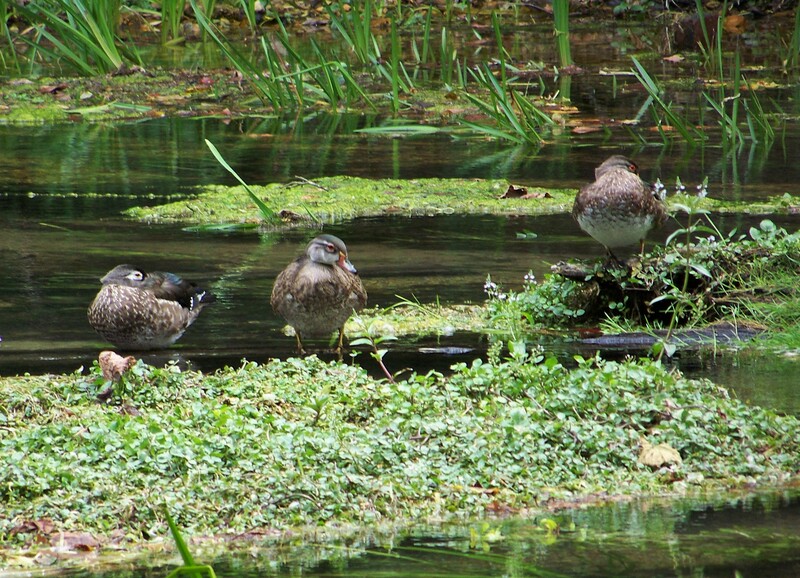 Wood Ducks are prominent inhabitants of the wetland area. You can learn more about this national park, and plan your own visit by visiting the park’s website at http://www.nps.gov/ozar/. While we were at the visitor center for the park, I picked up a cookbook entitled Secrets of the Great Old-Timey Cooks by Barbara Swell. It is full of recipes from years ago, the ones our grandmas and great-grandmas used to make. This recipe for fancy biscuits is adapted from this book. They are pretty, and when warm, they are absolutely delicious. I cannot wait to make some of them for my grandchildren when they come to visit. Sift the flour, baking powder, salt, and sugar together in a large bowl. With a pastry blender or a fork, combine the butter with the dry ingredients. In a small bowl, beat the egg with the milk; then add to the combined mixture. You may have to add a little more milk to make a soft dough that can be rolled out. Roll the dough into a rectangular shape about 1/4 inch thick. Cut into 3 inch squares. Cut each square diagonally from each corner to not quite the center. Then fold every other corner toward the center, as in a pinwheel. Use your thumb to close the center, leaving a large indentation. Bake on a greased pan at 450 degrees until lightly browned, about 10 minutes. Keep and eye on them so they do not burn at the pinwheel tips. When serving, put a dollop of jam, honey butter, preserves, or anything you can think of that would make these biscuits even better, in the center of each biscuit. Serve with coffer, tea, or milk.